Not to be confused with Koopa Kid. The Koopalings (Japanese: コクッパ Kokuppa; alternatively クッパ7人衆 Kuppa Shichi Ninshū, "Team of 7 Bowsers"), also known as Bowser's Minions (クッパの手下 Kuppa no Teshita) in Japan and Europe, and in certain North American works as the Koopa Kids, are a seven-member clan of recurring enemies in the Mario franchise, portrayed as siblings who act as leaders of the Koopa Troop under Bowser. Individually, they are named Larry, Morton, Wendy, Iggy, Roy, Lemmy, and Ludwig. The Koopalings debuted in Super Mario Bros. 3, and later appeared as bosses in various SNES-era Mario games before going on a long hiatus, reappearing once in 2003's Mario & Luigi: Superstar Saga, and then being redesigned for 2009's New Super Mario Bros. Wii, which has since been followed by numerous appearances as both bosses in the Super Mario platformers and playable characters in various spinoffs. They have also appeared in various other media, including the cartoon The Adventures of Super Mario Bros. 3, which featured entirely different names for the characters due to them not having official names at the time of its production phase. Originally, the Koopalings were depicted as Bowser's children and stated to be his offspring. However, Shigeru Miyamoto eventually affirmed that Nintendo's "current story is that the Koopalings are not Bowser's children" in 2012, leaving the Koopalings as his underlings and Bowser Jr. as his only child. 3.2 Amada Anime Series: Super Mario Bros.
Larry Koopa is the youngest Koopaling who is often seen at the forefront of the Koopalings' antics, and he wields the orange magic wand. His main color representation is sky blue, although his shell was originally colored green, his hair was white in early sprites, and he lacked the small star on the side of his face. There is some confusion over the identity of Larry's namesake; the most recent official statement from his Christener, Nintendo of America employee Dayvv Brooks, is that Larry was named as such because he simply "looked like a Larry," though Brooks had previously stated that Larry's name was derived from Larry Mullen Jr., the drummer for the Irish rock band U2. He was also known as "Cheatsy" in the cartoons, alluding to the fact that he will try to win by any means, legitimate or otherwise. He seems to have an interest in sports, such as how he plays tennis with a fireball in Mario & Luigi: Superstar Saga. In the Nintendo Comics System, he communicated via pictures in word bubbles, which only Lemmy understood. Morton Koopa Jr. is the only Koopaling to have a brown skin tone and is often depicted as the largest Koopaling, wielding the red magic wand. His main color representation is black, although his shell was colored green, his skin was yellow in Super Mario World, and he lacked the distinctive star on his face in his early in-game sprites. He is named after the American tabloid talk show presenter Morton Downey, Jr. He was also known as "Big Mouth" in the cartoons, due to his talkative nature, and often talks for long amounts of time, only to be stopped by one of his siblings. In other appearances, he seems to be rather grouchy, with brutal strength to match. Wendy O. Koopa is the sole female Koopaling; she wields the purple magic wand. Her main color representation is pink, although her shell was a shade of deep red in Super Mario World. She is named after Wendy O. Williams, an American singer and frontwoman of the punk rock band the Plasmatics. She was also known as "Kootie Pie" in the cartoons, and was considered a spoiled brat with a quick temper, often going into a rage over little things. She is stated to be tomboyish, and seemed to act as the de facto boss in Super Mario Adventures. Iggy Koopa is a hyperactive, demented, and unpredictable Koopaling who wields the yellow magic wand. His main choice of color is yellow-green, although his shell was colored blue in early sprites and his hair was white in Super Mario World; before New Super Mario Bros. Wii, his hair was also similar to Lemmy's. He is named after Iggy Pop, an American rock musician and frontman of the proto-punk band the Stooges. He was also known as "Hop" in the cartoons and is the twin brother of Hip (Lemmy); together, they are among the youngest members of the family. He was just as childish and immature as his brother in the cartoon series, whereas in the Nintendo Adventure Books he was depicted as a brilliant (if crazed) inventor; this has possibly been hinted at in New Super Mario Bros. U, where the inside of his ship is mechanical rather than wooden. Roy Koopa's head and sunglasses are pink (as was his shell originally), likely in reference to "real men/tough guys wear pink", and he wields the black magic wand. His main color representation is purple, although his shell and head were colored lavender-purple in Super Mario World. He is named after American rock & roll singer Roy Orbison. He was also known as "Bully" in the cartoons, and is said to be a typical bully who likes beating up others for his own amusement. This is true in most appearances, but in certain Japanese materials, Roy instead speaks in a calm and collected manner, so he may have more of a laid-back personality and be less of a tough guy. Lemmy Koopa is depicted as a small, fun-loving child who wields the green magic wand, and has been shown capable of being serious when the situation calls for it. In Super Mario World, his shell was colored yellow and his hair was white, although his shell was originally green and he lacked the ponytail. He is named after Lemmy Kilmister, frontman of the English heavy metal band Motörhead. He was also known as "Hip" in the cartoons and is the twin brother of Hop (Iggy); together, they are among the youngest members of the family. Lemmy is usually depicted as perhaps the least bright Koopaling, but is also the most genuinely innocent of his siblings. Ludwig von Koopa is the eldest who possesses a magnificent intelligence most likely superior to that of the other Koopalings (with the possible exception being Iggy), and wields the blue magic wand. His main color representation is deep blue, although he was originally depicted with a green shell in artwork (aqua-blue in Super Mario Bros. 3 and yellow in Super Mario World), as well as white hair in early sprites. He is named after German Classical and Romantic composer Ludwig van Beethoven. He was also known as "Kooky" in the cartoons, and had more of a mad scientist persona. Like his namesake, he is said to be a composer, and is very much into culture, but is also sometimes suggested to be the cruelest of the Koopalings. According to Mario & Luigi: Paper Jam, Ludwig egotistically believes himself to be a "real leader", to which the others, Morton and Iggy specifically, claim they never voted on it and further explain they operate as a collective trust. 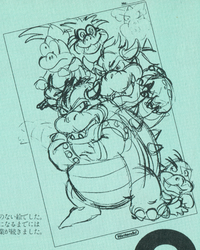 Early sketch of Bowser with Morton Koopa Jr., Lemmy Koopa, Iggy Koopa and Wendy O. Koopa made by Yoichi Kotabe and Takashi Tezuka. One of the first sketches in which the Koopalings can be seen, result of the collaboration between Yoichi Kotabe and Takashi Tezuka, is associated to Bowser's first redesign, happened before the release of the Family Computer Disk System version of Super Mario Bros.: The Lost Levels in 1986. The Koopalings were modeled after the design team of Super Mario Bros. 3, and they were all named after famous musicians by the game's North American localizers, since they were not given distinct names in the original Japanese version. In the Japanese version of Super Mario World, only their first names were adopted, dropping the Koopa surname, as was done in many subsequent games (both in English and Japanese). The Koopalings were all given different names in the cartoons, purportedly because Nintendo of America had not released their own names yet, forcing the writers of The Adventures of Super Mario Bros. 3 to come up with their own names. 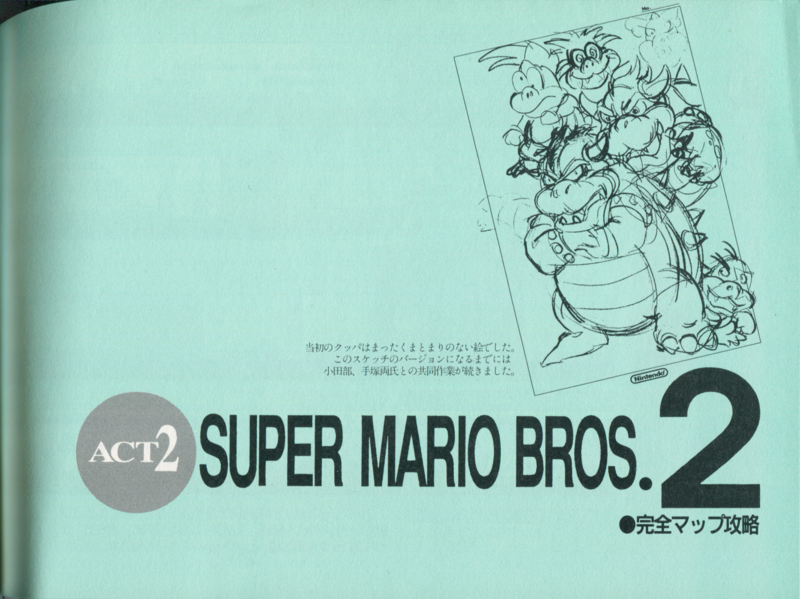 Early sketch, drawn by Yoichi Kotabe, of an artwork for Super Mario Bros. 3 featuring all of the Koopalings. The word "Koopaling" itself is likely a combination of the name "Koopa" with the diminutive suffix "-ling", which is often used to denote a younger, smaller or inferior version, which aptly describes their relation to Bowser. Similarly, their original Japanese name, "Kokuppa" is essentially "Little Koopa" (which is what the retainers serving the kings call them) or "Child Koopa", with Koopa being the Japanese name of Bowser. Interestingly, only their Italian name, Bowserotti, actually means Little Bowsers using the Western name of Bowser, with the names in the other languages leaving the Koopa word intact, even when it does not specifically mean Bowser. The English name also evokes such words as "fledgling", "hatchling", "youngling", or even "underling", and may be a mere portmanteau between one of them and "Koopa". Sprites of the Koopalings in Super Mario Bros. 3. Left to right, Larry, Morton, Wendy, Iggy, Roy, Lemmy, Ludwig. 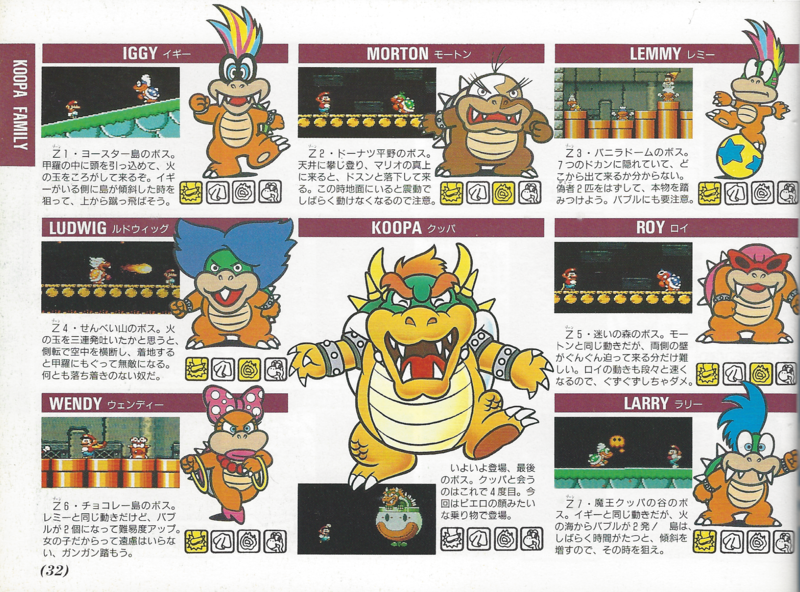 The first appearance of the seven Koopalings was in Super Mario Bros. 3 where they are the main bosses of the first seven worlds of the game. Here, the Koopalings were ordered by Bowser to use their airships and armies to conquer the various lands of the Mushroom World. Each Koopaling, after attacking a kingdom, stole the ruler's magic wand and transformed that ruler into an animal of some kind (or in the case of Pipe Land's ruler in the NES version, a plant). Mario and Luigi battle a Koopaling every time they travel through a heavily-guarded airship. The battle against the Koopalings consists mostly of dodging the Koopalings' leaps and magical blasts from their stolen wand. It takes three stomps on the head or nine fireballs in order to defeat a Koopaling. Unlike Bowser, they are immune to hammers. Once defeated, that Koopaling retreats into their shell, flies away and drops their magic wand. After Mario or Luigi picks it up, the airship vanishes and that world's king is restored. The Koopalings played the same role in Super Mario Advance 4: Super Mario Bros. 3, with Morton, Lemmy and Ludwig each given an extra e-Reader level. There is a scene showing Larry attacking Grass Land and turning its king into a Cobrat. In addition, if the player manages to defeat Bowser before defeating the other Koopalings, a cutscene plays when the player arrives at their respective world's castle that shows them ambushing the king, stealing the wand, and then departing shortly before Mario arrived. In the Japanese versions, one Koopaling appears on the key art of several level cards, with the only exceptions being Classic World 1-1 and No Time to Dawdle (both of which feature Mario and Luigi), Treacherous Halls (which features Boom Boom), Bowser's Last Stand, Bowser's Airship 1, and Bowser's Airship 2 (all three of which feature Bowser himself, for obvious reasons). To a lesser extent, the Koopalings also appeared on some of the level cards descriptions in the English releases of the level cards. Credits for the Super Mario World ending. In Super Mario World, the Koopalings aid Bowser in his attack on Dinosaur Land. Each Koopaling was charged with guarding a castle on each of Dinosaur Land's areas. After traveling through a Koopaling's castle, Mario or Luigi would battle a Koopaling, who would need to be bashed on the head three times, or in Iggy and Larry's case, knocked into the lava to be defeated. Morton, Ludwig, and Roy can also be defeated with a dozen fireballs. After a Koopaling was defeated, a captured Yoshi's Egg would be rescued, the castle would be destroyed and the path to a new area would be opened. Once defeated, Morton, Ludwig, and Roy went spiraling into the background wall (signified by a puff of smoke), while Iggy, Lemmy, Wendy and Larry all fell into the lava. Afterwards, Mario or Luigi would totally destroy their castle in a variety of different ways. The narration suggests their complete demise, though this was inserted in the English translation — the original Japanese text for each castle is uniform for each victory and does not individually refer to their loss. In International versions, each fort and castle can also be challenged again by holding L & R at the rubble. The Koopalings' in-game sprites differ drastically from their game artworks (likely due to technical restrictions). The Koopalings generally use the palettes intended for Koopa Troopas (blue for Iggy and Roy, green for Morton and Larry, yellow for Lemmy and Ludwig, and red for Wendy), and none of the Koopalings match their artwork coloration except Larry (who uses the green color sprite). Additionally, the game's cast roll uses alternate color palettes for three of the Koopalings: Morton gets a teal palette, the same one applied to the Buzzy Beetles' in-game sprites; Ludwig gets a pinkish-purple palette more appropriate for the shells of Roy and Wendy; and Roy gets a grey palette that would fit Morton's shell. Iggy also uses Larry's hairstyle during battle, despite the correct style being used during the game's cast roll. The original SNES version's sprites depicts the Koopalings with three fingers on each hand; this error was corrected in the Game Boy Advance remake to more closely resemble their actual appearances. 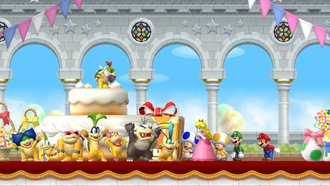 The Koopalings and Bowser Jr. jumping out of Princess Peach's cake in order (with Bowser Jr. on top of the cake). The Koopalings made a surprise return in New Super Mario Bros. Wii, serving as bosses in seven of the game's worlds. They also make an appearance in the game's opening sequence, hiding in a cake as cake toppings that the Koopalings presented Princess Peach with. Bowser Jr. also appears alongside the Koopalings. 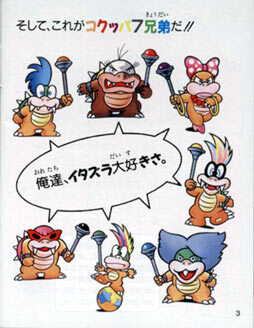 The seven Koopalings all sport what seems to be replicas of the magic wands from their first appearance, while Bowser Jr.'s Junior Clown Car is introduced. In the first seven worlds, Mario and his friends would have to ascend a Tower in the middle of the world, at the top of which the Koopaling of that world waited. When defeated in battle, the Koopaling then jumps away after their defeat, much like Bowser Jr. in the original New Super Mario Bros., setting up a rematch at the Castle at the end of the world. Upon catching up with the Koopaling again, Magikoopa appears and adds a new element to the battle, such as replacing the floor of Larry's room with one that shifts up and down, giving Lemmy an even larger Wonder Ball or even flooding Wendy's room. The Koopalings have also been given unique voices in this game; Roy, Morton and Ludwig in particular have noticeably deeper voices than they had in the cartoon series. After the credits, they are shown helping Bowser get back up (with the exception of Larry, who is shown just arriving, exhausted, and passing out before being gestured by Bowser Jr. to get up). When he does, however, Bowser's castle falls on top of them. When the screen cuts to black at the moment of impact, Bowser can be heard moaning in pain afterwards. In New Super Mario Bros. Wii, Larry is in World 1, Roy is in World 2, Lemmy is in World 3, Wendy is in World 4, Iggy is in World 5, Morton is in World 6, and Ludwig is in World 7. While in Super Mario Bros. 3 Morton was the boss of a desert world, Roy was the boss of a sky world, and Ludwig was the boss of a pipe world, these have all been slightly switched. Roy is the boss of a desert world, Ludwig is the boss of a sky world, and Morton is the boss of a mountain world (replacing the pipe world). Also, Iggy's giant world is replaced with a jungle world. Larry, Lemmy, and Wendy each retain their world themes (grass, ice, and water, respectively). The Koopalings capturing Princess Peach. The seven Koopalings reappear in the game New Super Mario Bros. 2 serving the main antagonist, Bowser. Five of them (Roy, Iggy, Wendy, Morton, and Ludwig) serve as the castle bosses of the first five main worlds, while the two others (Larry and Lemmy) are the castle bosses in the two special worlds. They use the Koopa Clown Car to kidnap Princess Peach, as seen in the intro, where Mario and Luigi fly around for coins while the Koopalings capture the Princess. After Mario and Luigi safely landed, the Koopalings crash onto the floor, making the Mario Bros. lose their Super Leaves. They show them Princess Peach and fly away, with Mario and Luigi closely behind them. One of the Koopalings is seen at the beginning of each world, where they run to the Tower with Princess Peach. After defeating the Reznors in the Tower, the Koopaling of this world comes down with a chain, laughing or taunting Mario and then disappearing again, running to their castle. After the castle fight, the next Koopaling awaits with Princess Peach, only to run away to the next world. They are also seen with the Koopa Clown Car to turn Mario into stone in the final castle by blasting a bright light. After Bowser's initial defeat, the Koopalings, similar to Magikoopa in New Super Mario Bros. Wii, attempt to aid Bowser by magically making him grow bigger, although this only resulted in them being knocked down by a giant Bowser. During the credits, they are seen trying to carry the defeated Bowser with the vehicle, but his weight pulls them down, scattering them all on the ground and trees. In this game, Roy is in World 1, Iggy is in World 2, Wendy is in World 3, Morton is in World 4, Ludwig is in World 5, Larry is in World Mushroom, and Lemmy is in World Flower. On a side note, when all Koopalings are in the Koopa Clown Car, the five Koopalings that are required to be fought (Roy, Iggy, Wendy, Morton and Ludwig) are within the car, while the two optional Koopalings (Larry and Lemmy) are holding onto the outside of the car. 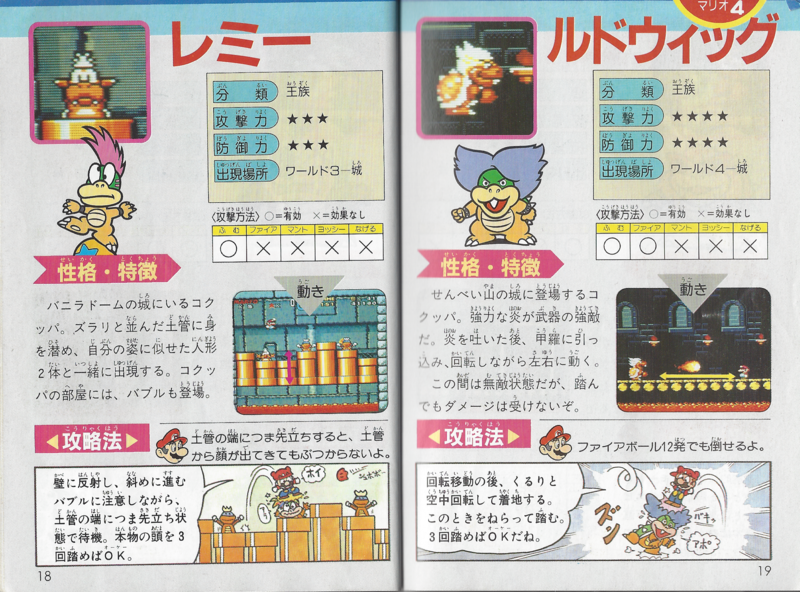 The New Super Mario Bros. 2 guide mistakenly gives the name Larry Koopa to Iggy Koopa. The Koopalings, along with Bowser Jr. and Magikoopa, return in the Wii U game New Super Mario Bros. U and its Nintendo Switch port. The Koopalings aid Bowser in seizing Peach's castle and also travel to the neighboring regions in order to ensure that the Mario Bros. don't return to the castle. Like in Super Mario Bros. 3, each Koopaling has a personal airship, which have now been stylized with decorations of their heads representing the bow and their colored shells on the top. They are bosses in castle levels once again, but are fought in their airships, which are accessed via a cannon within the castles. While Larry, Iggy and Ludwig retain their magic wands, Lemmy, Morton, Wendy and Roy don't use them this time around, and instead they have various weaponry. (e.g. Roy uses a handheld Bill Blaster during his battle) In addition, Larry, Morton, Wendy, Iggy, and Lemmy fight Mario in the cabin area of their airships, while Roy and Ludwig fight Mario on the crows nest of their airships. Lemmy is the Acorn Plains boss and thus the first Koopaling to fight, followed by Morton who is the boss of Layer Cake Desert, (which is his first time as a desert boss since Super Mario Bros. 3), Wendy as the Frosted Glacier boss, Larry as the Sparkling Waters boss, Iggy to be the boss of Soda Jungle, much like how he was the boss of World 5 in New Super Mario Bros. Wii and Roy as the boss of Rock-Candy Mines, leaving Ludwig as the final Koopaling to fight, like in the previous New Super Mario Bros games, as the boss of Meringue Clouds. After Bowser is defeated, the Koopalings attempt to get Bowser to jump to safety on his own beat-up airship. However, Bowser inadvertently destroyed the ship while attempting to board it, with the Koopalings clinging to Bowser's tail, while Bowser himself holds on to Bowser Jr.'s Junior Clown Car. The Koopalings return in New Super Luigi U. Unlike most other aspects of the game, they act the same way as they do in New Super Mario Bros. U. At the beginning of each castle, a stone face of the Koopaling with glowing eyes will appear on a wall, but is only for decorative purposes. Ludwig, Iggy, Larry, Roy, and Wendy, as they appear in the Amada Anime Series: Super Mario Bros. The first appearance of the Koopalings outside of video games was in the Japanese-exclusive Super Mario anime series, which was an adaptation of three fairy tales. In the Mario version of Momotarō, they appeared as the minions of Bowser, who was portrayed as the stories' ogre. The Koopalings also appeared as minions of Bowser (now the Wicked Queen) in the adaptation of Snow White ("Shirayukihime"). The Koopalings are fought within the first three volumes of the Super Mario-Kun, but they are rarely seen unless there is a volume based on a game they have appeared in. 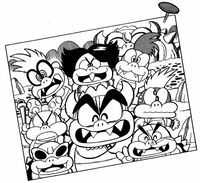 The Koopalings, as seen in The Adventures of Super Mario Bros. 3. In The Adventures of Super Mario Bros. 3 and Super Mario World produced by Nintendo and DIC Entertainment, the Koopalings (sometimes referred to as the Koopa Kids) were featured as recurring villains, replacing Mouser, Tryclyde, Fryguy and Clawgrip from The Super Mario Bros. Super Show!. They appear in these cartoons under altered names. This is likely due to the show's production preceding the North American release of Super Mario Bros. 3, which provided their individual names. In these cartoons, the relationship between Bowser and the Koopalings was interpreted as more of a powerful father spoiling his bratty children. They did things such as try to get his attention, gain his appreciation, and even plot against him. Cheatsy (Larry) and Kooky (Ludwig) seemed to be Bowser's favorites out of the bunch, which somewhat follows older game material. The Koopalings appear in the interactive anime adaptation of Super Mario World that was exclusive to Japan. Although Iggy and Lemmy are fought in the same worlds that they were fought in the prior games (Yoshi's Island and Vanilla Dome, respectively), Larry, Morton, Ludwig, Roy, and Wendy are fought together at Chocolate Island, whereas in the game, only Wendy was fought there. In addition, the battles with the Koopalings varied slightly from the game: Iggy has a horde of Koopa Troopas, Rexes, and Chargin' Chucks attack the Mario Bros., and later summons Koopa Paratroopas and Monty Moles before Yoshi takes care of them, forcing him to flee; Lemmy had blocked the route to him with a series of switches that operate a bridge, with Mario effortlessly knocking him aside when he solved the puzzle; Wendy produces copies of herself and then attempts to attack Mario while he's confused, but Mario stepped aside and leaves her dangling over the lava pit; and the others ganged up on Mario and Luigi shortly afterward, with Roy and Morton being stomped on and then getting back up, only to be swatted away with the other Koopalings by Mario's Cape Feather. 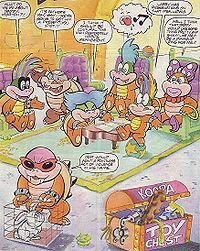 The Koopalings in the story "Bowser Knows Best"
The Koopalings are recurring characters in Valiant's Nintendo Comics System imprint. Here, their personalities were somewhat similar to their animated series counterparts, though they retain their names and appearances from the games. While Wendy and Lemmy each had solo appearances (the former in "Fins and Roses," and the latter in "The Buddy System" and "The Revenge of Pipe Ooze! "), their siblings only appear in the story "Bowser Knows Best" (where the group abduct Princess Toadstool for Bowser as a Father's Day present) and the short "Get Koop-ed Up With the Nicest People!" (where they and Bowser are shown vacationing in a resort called Klub Koopa). In Nintendo Power's Super Mario Adventures comic, the Koopalings aid Bowser in his plot to kidnap and marry Princess Toadstool, as he decided she would be a good mother for them. The Koopalings appear throughout the Nintendo Adventure Books, often aiding Bowser in his latest scheme, though they would occasionally strike out on their own, as was the case with Ludwig in Pipe Down! and Iggy in Brain Drain. The only book in which all seven appeared together was Koopa Capers, which has Wendy steal her brothers' wand so she can fuse them with her own to make a super wand that, along with minions loyal only to her, would allow her to usurp her father. Iggy is featured most commonly in the books, often appearing as the main threat due to whipping up a new invention like the GLOM, Monster Mixer and Synapse Switcher. Larry is utilized least often, his only noteworthy role in the series being ambushing Mario and Yoshi in an entirely skippable sequence in Dinosaur Dilemma. In Mario is Missing!, the Koopalings aid Bowser in his plan to melt Antarctica, thereby flooding the Earth. Presumably, they also headed each of the "Koopa critters" that were being deployed to steal the artifacts around the world. A Koopaling would guard the corridor of Bowser's fortress and battle Luigi, who was searching for his missing brother. In the Super Nintendo version of Mario is Missing!, only Ludwig, Roy and Iggy appear, although Larry and Morton are referenced in the manual; in the DOS version of the game, Lemmy and Morton are the only ones not appearing. Cut dialogue in the CD-ROM Deluxe version, however, implied that Lemmy and Morton were considered to be implemented as bosses. Also in the DOS version, instead of stomping the Koopalings a few times, Luigi defeats them with a single blast from a Fire Flower that he gains after locking each door on a floor. Until Mario Kart 8, the DOS version is also the only major appearance of the Koopalings where they speak intelligibly in-game. In Yoshi's Safari, the Koopalings once again aid Bowser in the conquest of a kingdom, this time Jewelry Land. In this game, the Koopalings attack Mario by using giant mecha weaponry. It would take various shots from Mario's Super Scope to beat a Koopaling, thus forcing it to hold up a white flag of defeat. Larry, Wendy, and Morton were also given plush toys as part of the Yoshi's Safari plush set (along with Mario, Yoshi, and Bowser). Iggy does not have his own hotel; he is instead faced before Bowser in his hotel, in a paper-thin disguise. The Koopalings in the order the player fights them. 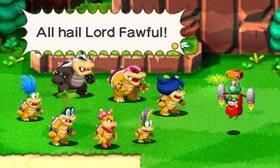 After several years absence, the Koopalings make a return appearance in Mario & Luigi: Superstar Saga. During the game, the witch Cackletta who had previously stolen Bowser's body takes control of Bowser's Castle and uses the fortress to attack Beanbean Castle Town. The Koopalings serve "Bowletta" and work to impede the Mario Bros.' progress. After getting into Bowser's Castle, Mario and Luigi fight the Koopalings in their respective rooms, usually needing to complete some sort of challenge in order to battle them. Additionally, the last three (Roy, Wendy, and Larry) use a special Time Bob-omb in battle. If the Mario Bros. failed to end the battle successfully in nine turns, the Bob-omb's timer would reach zero and it would explode, resulting in an instant Game Over. The Koopalings are encountered in the same order as in Super Mario World (Iggy, Morton, Lemmy, Ludwig, Roy, Wendy, and Larry). After being defeated, each Koopaling leaves a warp point for the Mario Bros. The Koopalings in Minion Quest: The Search for Bowser. They also appear in the remake Mario & Luigi: Superstar Saga + Bowser's Minions. In the former mode, they have the same role as before, although the battles are different, especially that against Ludwig, and this time they actually have dialogue, with Morton's personality being influenced by Paper Mario: Color Splash in the way he talks. In the latter mode, they act as playable characters and bosses, where they have been controlled by a more powerful version of a spray sent by Fawful and are sent to conquer the Beanbean Kingdom, and they are gradually rescued from the effects of the spray by Captain Goomba, joining him and the other minions of Bowser to save the latter in the Beanbean Kingdom. In said mode, they initally display arrogance and disrespect toward their minions, outright ignoring the warnings sent to them by Captain Goomba, while toward the end of the story almost all of them, with the exception of Roy, end up recognizing his superiority, while still retaining an higher rank than him. In general, in this game it is noted how the Koopalings are among the highest ranking of Bowser's minions, as can be seen by the underlings using terms such as Sir, my Lordship, Master when talking to them; Ludwig is also again their leader, as briefly hinted in Gwarhar Lagoon and then reconfirmed in the battle where Captain Goomba must prove his loyalty to Bowser as well as his prowess in battle by fighting all the Koopalings he just rescued from the effects of the spray. Larry, Iggy, Wendy, Morton and Roy are found in the Beanbean Outskirts, Chucklehuck Woods, Gwarhar Lagoon, Teehee Valley and Joke's End respectively, while Lemmy and Ludwig stay in Bowser's Castle. After being beaten on a stage, they are replaced by dark version of them just like the other characters that can be rescued from the effects of Fawful's spray. Since in the Minion's Quest mode all the minions of Bowser are sent against Mario and Luigi by Bowletta disguised as Bowser, the cutscene where Bowletta calls the Koopalings against Mario and Luigi is missing in the remake. They are later present during Bowser's official reinstatement of Captain Goomba into leader of the Koopa Troop forces, and the subsequent demotion of Captain Goomba from both this position and his rank of Captain after it was discovered that Captain Goomba was, albeit unintentionally, the reason why Bowser was rendered amnesiac beforehand. The Koopalings in Mario & Luigi: Paper Jam. “"I thought we were operating as a collective trust!" The Koopalings make an appearance in Mario & Luigi: Paper Jam, as the tertiary antagonists. Contrary to Mario & Luigi: Superstar Saga, the Koopalings have in-game dialogue. Mario, Luigi and Paper Mario encounter them at specific points throughout the adventure, which is again unlike in Mario & Luigi: Superstar Saga, where they were only encountered during the end of the game before the final fights with Fawful and Cackletta. 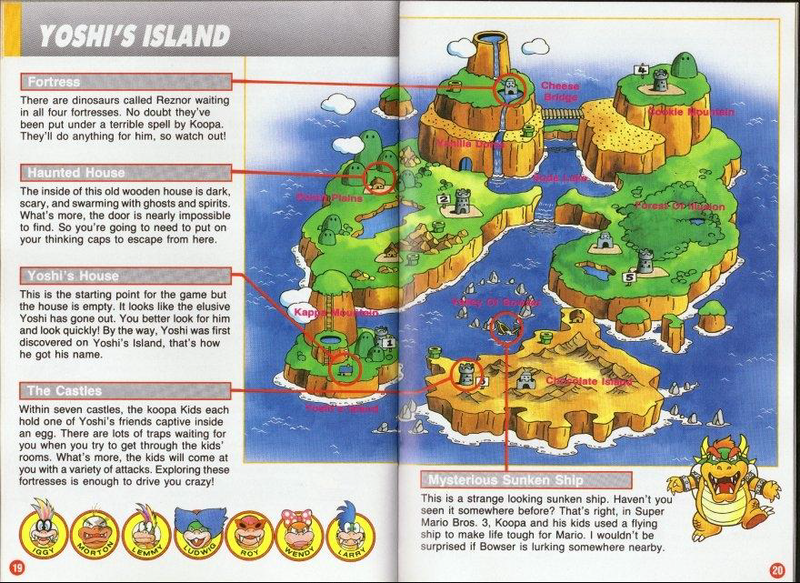 Although paper versions of the Koopalings are not featured, they are alluded to; when Roy asks Wendy why there are no paper counterparts of the Koopalings, she speculates that they are "probably just busy doing important stuff back home." 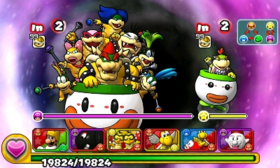 Although they were not present in the original game, the Koopalings appear in the remake's add-on story mode Bowser Jr.'s Journey, acting as Bowser Jr.'s allies. Bowser had told the Koopalings to look after Bowser Jr. while he went to Peach's Castle. Lemmy was initially not with the group since he decided to stay at Bowser's Castle. However, they each left Bowser Jr. for different reasons; Ludwig was worried something was wrong at Bowser's Castle, Roy ended up being fed up with his more selfish nature, Larry and Wendy in order to attempt to save Bowser's Castle from falling under Fawful's control, Iggy due to Bowser Jr. firing him due to finding him annoying, and Morton was brainwashed by the main villains, the Best Fitness Friends, into turning against him via the Malatone Formula:X. One Koopaling (along with Kamek) can be set as a First officer which gives stat boosts depending on which Koopaling, and each one also has their own Captain commands. During the final battle against the Best Fitness Friends' combined form, the latter entity summons dark doppelgangers of the Koopalings to act as its troops. Artwork of the Koopalings, from Mario Kart 8. The Koopalings make their spin-off debut appearance as unlockable playable characters in Mario Kart 8. This also marks the first appearance overall of the Koopalings as playable characters. Larry, Wendy, and Lemmy are classified as lightweight characters, Iggy and Ludwig are medium weight, and Morton and Roy are heavyweight. The Koopalings get their own emblems similar to Bowser and Bowser Jr.'s in this game. The parts used by the Koopalings receive extra details, but as with characters such as Metal Mario, Pink Gold Peach, Bowser, Donkey Kong, certain Mii, Yoshi and Shy Guy colors as well as downloadable characters, this mainly consists of unique frames for their Standard Karts, Standard Bikes, Standard ATVs and Super Gliders. In addition to these, all the Koopalings, unlike the other characters, have Pipe Frames with unique colored steering wheels and exhaust pipes as well as Landships which are based on their personal airships from New Super Mario Bros. U.
CPU-controlled Koopalings, as well as Bowser, may use the Landship as their vehicle of choice aside from the Standard bodies and the Pipe Frame. The Koopalings return in the Nintendo Switch port Mario Kart 8 Deluxe, this time as default playable characters. The Koopalings make their Super Smash Bros. series debut as unlockable (default in the Wii U version) newcomers in Super Smash Bros. for Nintendo 3DS and Super Smash Bros. for Wii U, as seven model swaps of Bowser Jr. They all have their own voices and are acknowledged as separate fighters by the announcer (similar to how Alph is a "separate" fighter from Olimar). Each Koopaling drives a specific-colored Junior Clown Car that have yellow eyes instead of black like Bowser Jr.'s version. They all fight identically, however. Because each Koopaling is a model swap of Bowser Jr., they all have been resized to match him in height (and, to some extent, their in-game heights from games such as Super Mario Bros. 3 and Super Mario World), and they also use Bowser Jr.'s animations, but some retain their unique properties; for example, Iggy is thinner than the others. The order Bowser Jr. and the Koopalings are scrolled though (by pressing ) is similar to the order the Koopalings are fought in Super Mario Bros. 3 (except Roy and Morton, which switched spots), starting with Bowser Jr., then Larry, Roy, Wendy, Iggy, Morton, Lemmy, and Ludwig. Because the Koopalings are model swaps of Bowser Jr., they are unlocked as playable characters in the 3DS version at the same time as him (after the player either clears Classic Mode on 6.0 intensity or higher as Bowser or plays 100 matches, then defeats Bowser Jr. on the 3D Land stage). The Koopalings reuse their voice clips from the New Super Mario Bros. games. Thus, Larry, Lemmy, Wendy, and Morton are voiced by Lani Minella, Iggy and Ludwig are voiced by Mike Vaughn, and Roy is voiced by Dan Falcone. Similar to the other fighters, they are also subject to Pit's Smash Taunt, Palutena's Guidance. However, other than their full name when identified by Palutena, all the conversations are the same. They also have their own titles in the Boxing Ring monitor for the Wii U version. It should be noted, however, that them possessing their own titles and attributes is only the case in International versions; in the Japanese version, they actually share the same title as Bowser Jr., which is 「万能のチャリオット」 (or "all-purpose chariot"). The Koopalings return as alternate skins for Bowser Jr. in Super Smash Bros. Ultimate. Now, each Koopaling has unique facial expressions from Bowser Jr., as opposed to sharing them. Additionally, when attacking during Abandon Ship, each of the Koopalings use their own wands, as opposed to attacking with the same hammer like Bowser Jr.
Bowser, the Koopalings, and Bowser Jr., in the final battle. The Koopalings return as bosses to fight at the end of each world in Puzzle & Dragons: Super Mario Bros. Edition. Additionally, they reappear during the final battle alongside Bowser and Bowser Jr., riding in the Koopa Clown Car with Bowser. The combination of the Koopalings and Bowser is treated as a single enemy, and is named Bowser and His Minions. Unlike most other enemies in this game, the Koopalings are one of a kind enemies who can't be recruited by normal means. Instead, the player has to defeat them at their special world airships in order to recruit them. Upon joining the player as allies, the Koopalings stop appearing as enemies, and instead, get replaced by generic enemies for their castles and airships. Also, the player is not able to part ways with any of the Koopalings, nor can they be depowered. As of version 2.0, each of the Koopalings have received two different transformations, with each one having them be paired with one or more generic enemies. This in return, gives them a sub-attribute, along with altering their Awoken Skill. The transformations can be switched at any time by using the proper transformation items, but once the player has transformed the Koopalings, it is impossible to revert them back to their original forms. Ludwig, Wendy, Larry and Roy appear as playable characters in Mario & Sonic at the Rio 2016 Olympic Games. In the 3DS version, they can only be used in certain events; Larry plays Equestrian, Wendy plays 100m Freestyle, Roy plays Beach Volleyball, and Ludwig plays Table Tennis. In the Wii U version, only Larry and Wendy appear as playable 'guest' characters, and Ludwig and Roy have been cut. Like in the 3DS version, Larry can only be used in Equestrian and Wendy in 100m Freestyle. The Koopalings once again speak in-game (with the exception of Ludwig, who does not appear in the 3DS version's story mode), and again, their voice clips are reused from Mario Kart 8. Iggy, Lemmy, and Morton do not appear as playable characters, but there are unlockable Mii costumes based on them. There are Mii costumes based on Ludwig, Wendy, Larry and Roy, as well. The Koopalings and their magic wands in Paper Mario: Color Splash. Note their size compared to that of Mario (on the left). In Paper Mario: Color Splash, the Koopalings make their Paper Mario series debut, appearing as bosses. They are fought in order to obtain Big Paint Stars, whose color depends on the magic wand the Koopaling wields. Morton appears in The Crimson Tower to get the red star; Iggy guards the yellow star at The Golden Coliseum; Ludwig guards the blue star at Fort Cobalt; Wendy guards the purple star on Fortune Island; Larry tries to get the orange star at Starlight Cape; Lemmy guards the green star at The Emerald Circus; and Roy, whose wand color is black, has no Big Paint Star to guard, but fights Mario in Black Bowser's Castle. As in Mario & Luigi: Paper Jam, the Koopalings have spoken dialogue, but some of them are portrayed differently in this game. After being defeated, the Koopalings appear in the final scene of the game, fleeing from Prism Island on an airship with Bowser taped to the ship, although a stray firework hits the airship, forcing them to crash land off screen. They also appear together during the game's staff credits parade. The paper versions of the Koopalings follow the designs introduced in New Super Mario Bros. Wii with a bigger size than the one shown in that game. Additionally, the sprites of Ludwig, Wendy, Lemmy and Roy present a pose derived from artwork released during the 30th anniversary of Super Mario Bros. and some of their features, notably the color of the eyebrows, are derived from said artwork as well. Each Koopaling also has a unique sound for their speech bubbles when they talk. The Koopalings' Enemy Cards in Paper Mario: Color Splash, sorted from left to right according to the order in which they are obtained. Defeated Koopalings can also be summoned in battle using their Enemy Cards won by beating the Rock Paper Wizard at the Roshambo Temples. Immediately after being summoned, they make enemies flee by running into them. Just like the other enemies summoned through Enemy Cards, they run away when in front of major bosses, however, unlike normal enemies, they run into minor bosses that are forced to escape, only to return soon after. The Koopalings' likeness can be seen in the DOS and SNES versions of Mario's Time Machine as statues on the first and second floor, and as wall torches in the background of the last floor, with Ludwig, Roy, and Larry or Iggy in particular being seen in the latter. Iggy and Larry appear in Mario's Early Years. Iggy is in the alphabet, and Larry comes out of a pipe if the player chooses the correct answer, saying "I like your choice". Lemmy also makes a cameo appearance in Super Scope 6, in which he is shown riding a missile and chasing a plane piloted by Mario, while a short clip of Mario fighting Iggy in Super Mario World is briefly shown during F.L.U.D.D. 's scan in Super Mario Sunshine. Unused Super Princess Peach sprites. 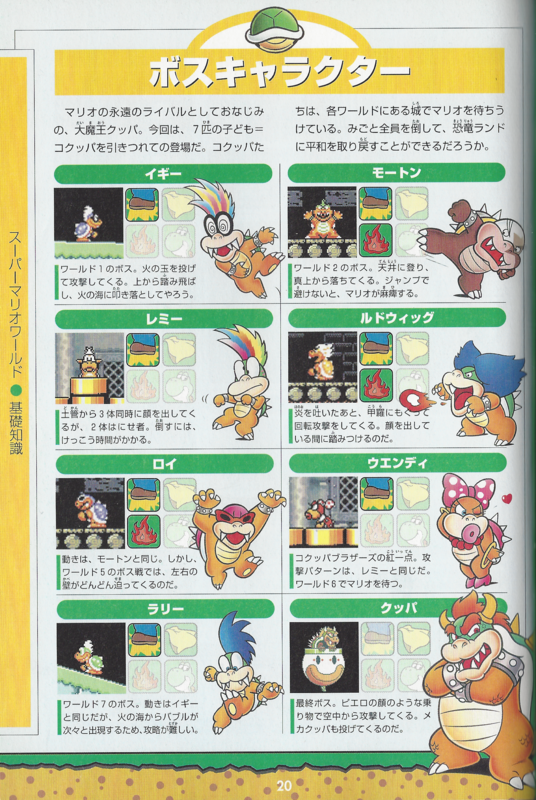 The Koopalings were originally going to appear in Super Princess Peach as boss characters in the order of Super Mario World, though they were dropped from the final version of the game for unknown reasons. According to the unused sprites, Roy and Morton's shells were apparently going to be colored green rather than their respective original pink and grey. The Koopalings are briefly mentioned as Bowser's children in his trophy in Super Smash Bros. Melee, but only Bowser Jr. is mentioned in the Super Smash Bros. Brawl trophy, while Ludwig alone appears as a Sticker. In Mario & Sonic at the London 2012 Olympic Games and Mario & Sonic at the Sochi 2014 Olympic Winter Games, costumes that are based on the Koopalings can be unlocked in that game, and are unlocked in the same order as the Koopalings were fought in New Super Mario Bros. Wii. The Koopalings make a cameo appearance in Mario Kart Arcade GP DX on banners in the Aerial Road and Sky Arena tracks. The Koopalings appear in Super Mario Bros. 3 challenges in NES Remix 2. An entire challenge is dedicated to beating all the seven in a row in the order they were fought in Super Mario Bros. 3. In addition, Iggy and Larry have their own challenges. Iggy has to be defeated as Frog Mario, while Larry has to be defeated as Small Mario. All 7 Koopalings are included as Bosses in the Boss Card deck of Monopoly Gamer. They are joined by either Bowser (in the Standard Edition) or Bowser Jr. (in the Collector's edition) as the "Final Boss". Their boss order is the same as from Super Mario Bros. 3. While the Koopalings do not appear in Mario Tennis Aces, their airships can be seen in the background of the Savage Sea court. The Koopalings' depiction in New Super Mario Bros. U. All the Koopalings look relatively similar to Bowser and Bowser Jr., but lack horns on their head. Morton has a unique darker complexion, and three have heads that are not green in coloration (Morton's head is white and Roy's is pink while Wendy's head matches the rest of her body's yellow coloration). Three of them (Larry, Wendy and in part Iggy) have blue eyes much like Bowser in Super Mario Bros. 3 (but while Bowser's eyes were changed to red, the Koopalings' eyes remained blue). Originally, Ludwig, Morton and Lemmy's eyes were merely black dots, however the former two have since been shown to have thin dark grey irises. All of them have pointed claws on their hands. All the Koopalings have various distinguishing features, such as varying numbers of teeth protruding from their snouts and unique hair styles and colors. Oddly, their sprites in Super Mario World and the Super Mario Bros. 3 remake in Super Mario All-Stars gave them all white hair and coloration that did not match their artwork, carrying over from the original, inaccurate color palette from the NES. All of them, like Bowser, have ribbed plated bellies. Although the Koopalings were shown in the sprites to have at least four spikes on their shells, the cover for Nintendo Power Player's Guide for Super Mario All-Stars showed them, or at least Morton and Roy, only having three spines, all of which were directly on the center of the shell from top to bottom. In addition, while Lemmy does not have fangs, his in-game depiction in Super Mario World does. While most of the Koopalings originally had green shells, redesigns introduced with New Super Mario Bros. Wii gave them all unique shell colors. Other aspects of their pre-existing designs were also tweaked, such as Iggy's hair being green rather than multicolored in order to differentiate him further from Lemmy, and their heights and builds being more varied, with Morton now the tallest, followed by Iggy, Roy, Ludwig, Wendy, Larry and finally Lemmy, who was the runt of the litter in their original appearances as well. Their tails also became visible in their official artwork starting from New Super Mario Bros. Wii, having not been drawn until then except for some sprite depictions and an artwork which apparently shows Iggy's tail. In their appearances in Super Smash Bros. for Nintendo 3DS / Wii U and Super Smash Bros. Ultimate, because they are model swaps of Bowser Jr., all of the Koopalings appear roughly the same height as one another, most notably with Roy, Iggy, Morton and Lemmy (although Iggy is still thin). The Koopalings' designs were modified in the DIC cartoons, although they were still recognizable. The Koopalings' individual personalities have not been fleshed out much besides being childlike, their desire to cause mayhem, and their loyalty to Bowser. However, there were some hints in various supplementary materials. Some of the personalities changed between localizations. For example, Roy in the North American localizations was depicted in a manner similar to a bully (which also earned him the name "Bully" in the DIC cartoons), but the Japanese Super Mario Bros. 3 instruction booklet and Super Mario Advance 4 e-Reader cards give him a calm and collected demeanor. The original manual also gave each of the Koopalings several quirks unique to each of them that hinted at their individual personalities with some speeches uttered by them; however, the official English translation toned down several of these quirks or removed them altogether. Although loyal to Bowser, they also did not wish to be on the receiving end of Bowser's rage if they failed a task, as evidenced by Larry's reason for why he and the other Koopalings will not give up the kings' wands easily to Mario, as he stated that the alternative would be to get yelled at by Bowser. Prior to their modern depictions, they were given distinguishing characteristics in The Adventures of Super Mario Bros. 3 and the Super Mario World cartoon, as well as the Nintendo Comics System and Nintendo Adventure Books. In Mario Kart 8, the Koopalings seem to have better speech capabilities than Bowser, as they can be heard saying their names at several points, and even yelling one or two-liners. In addition to being childlike, a Play Nintendo quiz describes the Koopalings as "zany". The Koopalings' loyalty to Bowser is strong enough that they are willing to serve him even when "Bowser" is actually not himself and in fact possessed by another figure. This is implied by their servitude to Bowletta in Mario & Luigi: Superstar Saga and later confirmed in Paper Mario: Color Splash, where Wendy and Larry specifically mention doing their actions for Bowser and Morton indirectly says that as well despite Bowser being under the influence of black paint. In the remake, they also possessed strong enough wills that Fawful, when brainwashing them with his spray, was ultimately forced to use a maximum potent dosage on them to sway them to his side. They were also willing to work with Bowser's son, Bowser Jr., and had little problem with him, as implied by Roy Koopa briefly calling him squirt (Young Master in the Japanese version) and overall talking to him in a casual nature. However, Bowser Jr.'s Journey indicated that even they have their limits when working with Bowser Jr., as many of them ended up quitting on him due to being fed up with his notoriously selfish nature while they were trying to hunt for the remedy for the blorbs. The Koopalings each have varying abilities, but in general, the Koopalings are capable of using their shell as both a method of defense and a method of offense. In addition, they are all capable of jumping very high, and are all skilled in magic, frequently using magic wands as a weapon. While only Ludwig, Iggy, and Larry spat fireballs in Super Mario World, Mario & Luigi: Superstar Saga revealed that all Koopalings have this ability. Despite that, they are weak to fireballs, though their exact limit has varied between taking multiple fireballs to take down, or being one-hit knocked out by a single fireball. Similar to Bowser, they also have a tendency to survive dangerous hits. This is especially evident with their defeat in Super Mario World, where Larry, Wendy, Iggy, and Lemmy were dunked into lava by the Mario Bros., and each Koopaling later had their castles collapse on them, in New Super Mario Bros. Wii where they, alongside Bowser and Bowser Jr., ended up surviving being crushed by Bowser's falling castle, and in New Super Mario Bros. 2, where all of them were accidentally knocked into the lava twice (once by a gigantic Bowser, and then from a gigantic Dry Bowser). Their fighting prowess was such that they managed to casually knock away several Beanies while discussing how they can find Bowser at the same time in Mario & Luigi: Superstar Saga + Bowser's Minions. In terms of talents unique to individual Koopalings, they seem to know their own spells. While most of them simply cast a colorful shot of magic that slowly flies in a straight line, Wendy instead creates glowing rings that ricochet off the surfaces of the room, and Lemmy creates bouncing circus balls that can knock the Mario Bros. into a bottomless pit. In every game appearance outside of Super Mario World, Lemmy is always seen in battle balancing on top of a big yellow circus ball covered with starry patterns. Ludwig could create earthquakes with his descents in Super Mario Bros. 3, an ability that was taken away from him ever since New Super Mario Bros. Wii, but kept by Roy and Morton. Ludwig was given the ability to flutter jump in the New Super Mario Bros. games instead. In Super Mario World, Roy and Morton were able to walk up walls and ceilings and drop down at will. In their first appearance in Super Mario Bros. 3, the Koopalings were introduced as siblings and Bowser's own children. Most re-releases and remakes of this game as well as republications of the game's story keep this detail intact in Japan, with the Wii Virtual Console manual omitting direct references to the Koopalings being Bowser's kids and the Encyclopedia Super Mario Bros. using a less strong statement than the one found in the original manual retained only in the French translation, while the German and Spanish translations of said book completely omit that the Koopalings are siblings and Bowser's children. 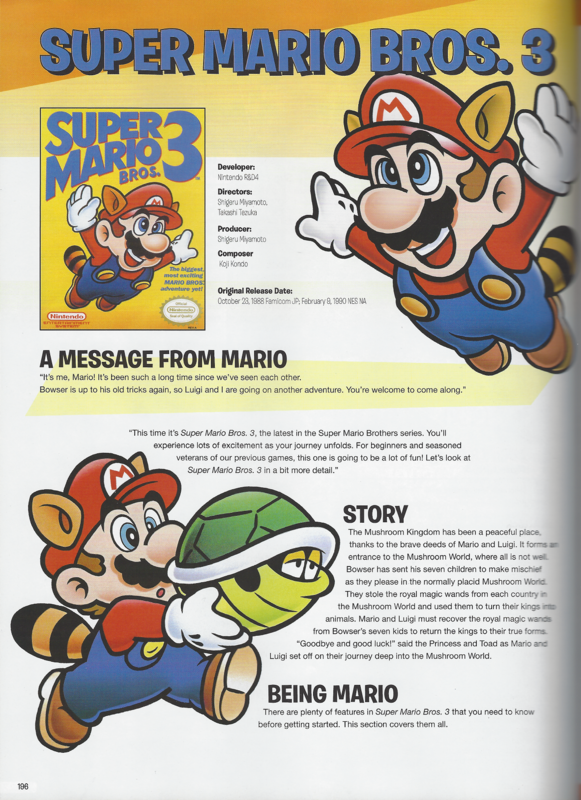 Translations of Super Mario Bros. 3, its rereleases, remakes, official guides and websites have kept this detail to varying degree, with some calling the Koopalings Bowser's offspring. The cartoon based on the game, The Adventures of Super Mario Bros. 3, follows this portrayal. 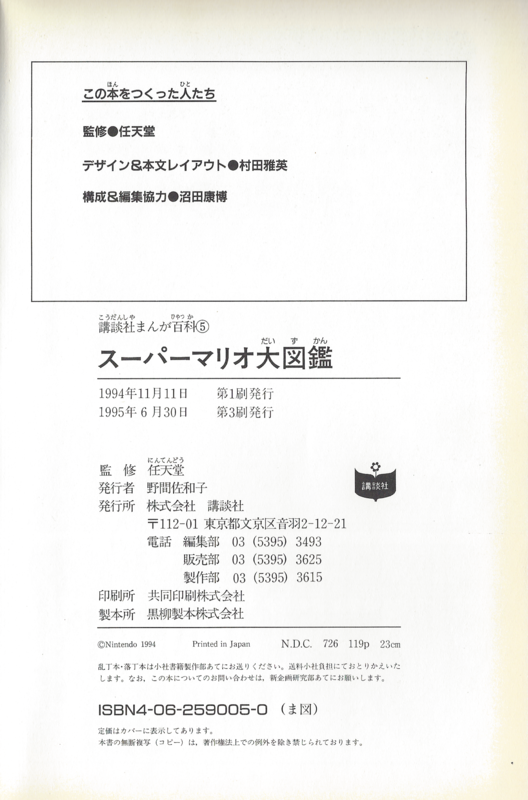 In-game text and the manual of the Japanese version of Super Mario World and its rereleases and remakes don't make any direct statements about the relationship, which is nonetheless mentioned in the English version, the Japanese Nintendo Official Guidebooks and related Japanese materials. In three character books written with the involvement of Nintendo, the Koopalings are considered Bowser's children and in two cases explicitly stated to be members of his royal family (「王族」). The back of the English-language version of Yoshi's Safari box call them Bowser's "offspring" and the French translation of said text uses the same term as well, which is absent in the Japanese manual. The manual for the SNES version of Mario is Missing! vaguely describes the Koopalings as Bowser's "bad boys" (Wendy was not shown to be involved in that game), although in the DOS version's in-game dialogue, the Koopalings refer to Bowser by name rather than with a familial title. 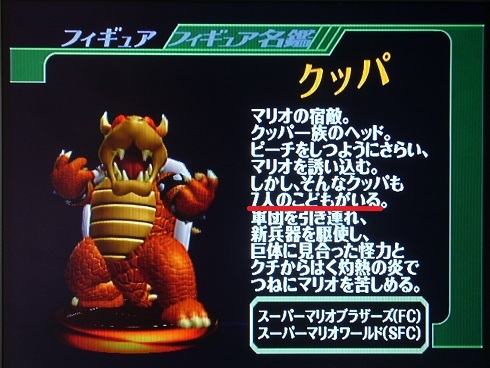 In Super Smash Bros. Melee, Bowser's seven children are mentioned in both the original Japanese version as well as its English localization, and the relationship between them and Bowser is mentioned as well in the Super Mario Advance series. Following the introduction of Bowser Jr., the lack of major appearances from the Koopalings since Mario & Luigi: Superstar Saga and Bowser Jr. being treated independently from them, there was confusion about the nature of Bowser's parenthood and raised concerns that Bowser Jr. had replaced the Koopalings as Bowser's sole child. This is first seen in Bowser's trophy Super Smash Bros. Brawl, where Bowser Jr. is referred to as 「ひとり息子」, meaning "one son" or "only son". While both the Koopalings and Bowser Jr. appear together in New Super Mario Bros. Wii, official websites merely refer to the Koopalings as Bowser's minions rather than his children, and comrades rather than siblings. 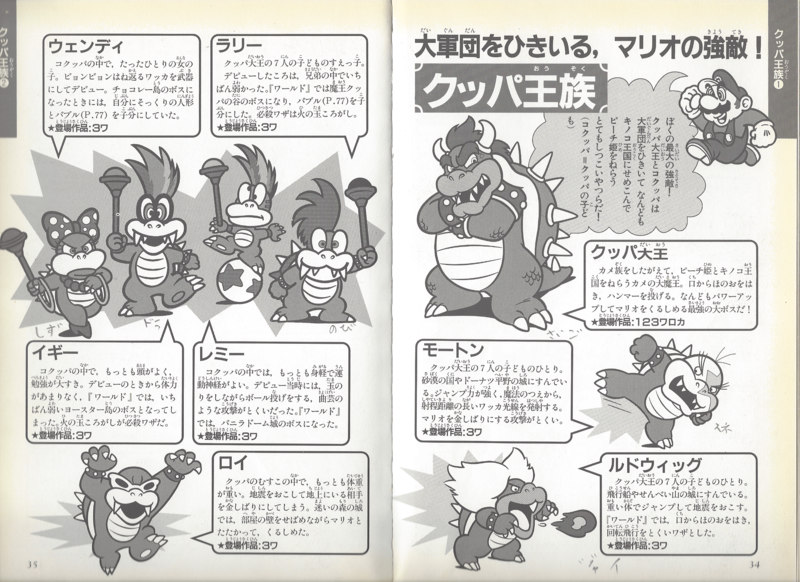 However, the Prima guide refers to them all as Bowser's eight kids (counting Bowser Jr. among their ranks). In a September 2012 interview, Shigeru Miyamoto, speaking with Takashi Tezuka, went on record to say that their "current story is that the seven Koopalings are not Bowser's children", leaving Bowser Jr. as his only child with an unknown mother. However, during the Japanese Nintendo Direct announcement of the Koopalings as playable characters in Mario Kart 8, they are described as 「クッパ大魔王の子分」 (King Koopa's kobun), wherein the Japanese word "kobun" can refer to either underlings or adopted children. Their guidance conversation in Super Smash Bros. for Wii U and later Super Smash Bros. Ultimate lampshades their connection with Bowser and Bowser Jr. by noting the Koopalings' resemblance to Bowser Jr. and calling the relationship between them and Bowser a mystery. There have also been hints for Bowser needing to treat them more like his family, suggesting that the family relationship is ambiguous. With the release of Mario & Luigi: Paper Jam, the Koopalings started having lines of dialogue again, that then appeared in Mario & Sonic at the Rio 2016 Olympic Games and in Paper Mario: Color Splash. To reflect their revised portrayal, in the Japanese version of said lines of dialogue, the Koopalings always refer to Bowser as Master Bowser (「クッパ様」) and consider each other comrades (「仲間」) without any family relationship. However, at the same time the European localizations were apparently given more freedom in the portrayal of the Koopalings, beside them still being siblings and the return of the Koopalings term since Mario & Luigi: Paper Jam. While said game keeps the Koopalings' relationship to Bowser simply as his minions in English and Japanese versions, in the Italian and German translations, the Koopalings' father is briefly called to and explicitly stated to be Bowser, respectively, and the Italian localization of Paper Mario: Color Splash is devoid of every explicit statement of the Koopalings as Bowser's minions present in the Japanese version. 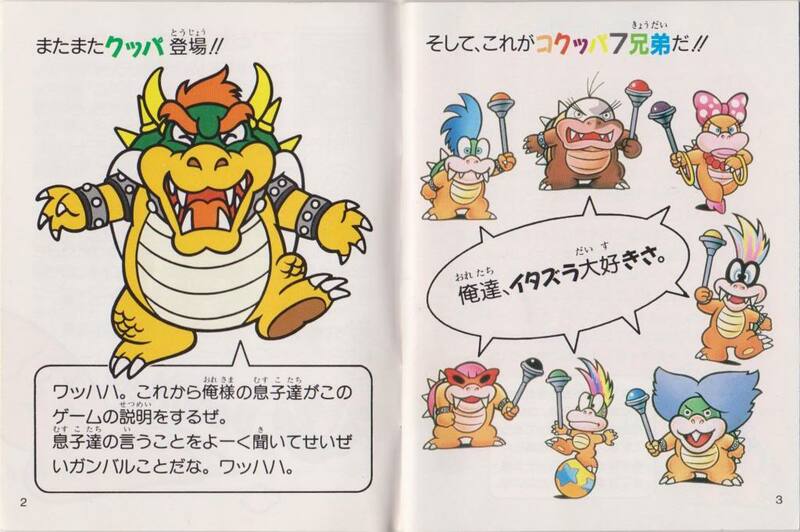 In the Italian manual of Monopoly Gamer Collector's Edition, the Koopalings are presented as seven among Bowser's minions, while the Italian and German localization of Minion Quest: The Search for Bowser keep a Japanese sentence stating that Bowser Jr. is the only son of Bowser. The Japanese site of New Super Mario Bros. U Deluxe, beside referring to them using the modern Team of Seven Bowsers (｢クッパ7人衆｣) term instead of the original Bowser's Minions (｢クッパの手下｣) term, also indicates their current role as being that of leaders of the Bowser clan (｢クッパ一味の幹部｣). 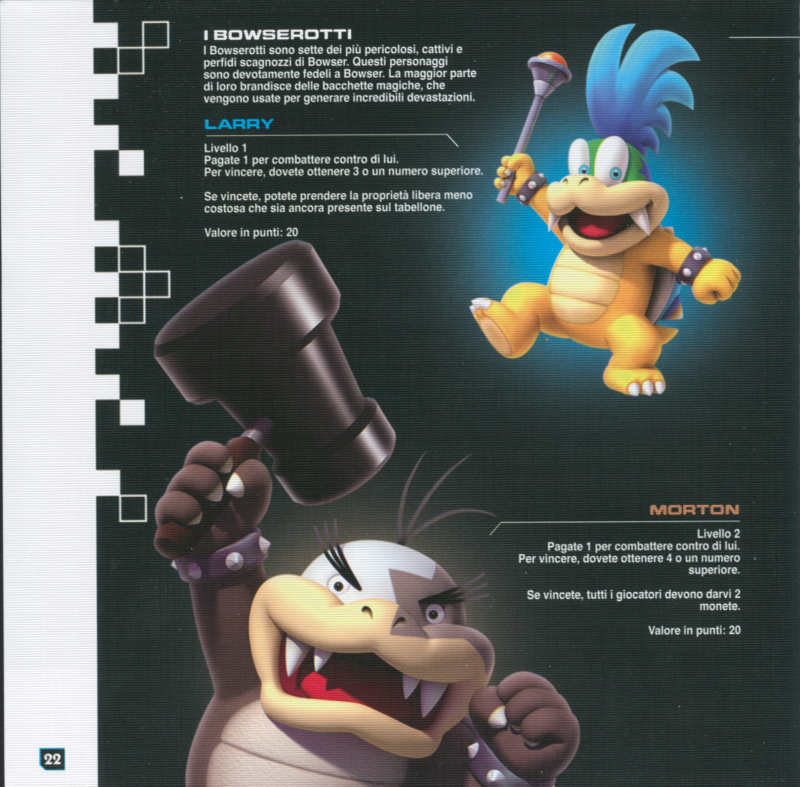 In Nintendo Power, Larry was stated to be the youngest of the Koopalings (reaffirmed as still true in the North American version of Super Smash Bros. for Wii U), while Ludwig was said to be the oldest. The birth order for the five middle children was not confirmed, although in Super Mario Bros. 3, as Larry is the first Koopaling to be fought and Ludwig is the last, the implication would seem to be that all seven Koopalings are fought in order from youngest to oldest (provided the player doesn't warp); however, Morton is described as "one of the older Koopalings," although this may have been in relation to Larry, the previous boss encountered. The same guide also stated that Ludwig is Bowser's second in command, although this has since been supplanted by characters like Kammy Koopa, Kamek, and Bowser Jr., as well as English versions of Super Smash Bros. for Nintendo 3DS and the European version of Super Smash Bros. for Wii U stating that Larry leads the Koopalings (though this is possibly due to a mistranslation). The Prima strategy guide for Super Mario Advance 4: Super Mario Bros 3 describes Roy as being "a little heavier than his younger family", which might indicate that Roy is one of the older Koopalings. In Mario & Luigi: Paper Jam, Larry calls Ludwig "boss", and Ludwig shows that he thinks of himself as a leader, and even a king. In The Adventures of Super Mario Bros. 3, Hip and Hop (Lemmy and Iggy) are depicted as twins and are contradictorily believed to be the youngest. Although Kootie Pie (Wendy) celebrated her sixteenth birthday in "Reptiles in the Rose Garden", the specific ages of the others was never confirmed. According to the Writer's Bible included on the Shout! Factory DVD set and brief concept clips of the cartoon, the other Koopalings were all teenagers; Bully was the eldest, followed by Big Mouth, Kooky, Cheatsy, Kootie Pie, and finally Hop and Hip both at six years old. This is seemingly the reference used for the Nintendo Adventure Books, since in Leaping Lizards Morton exclaims “Little brothers are so cowardly!” in regards to Iggy, although this may have been a quip at Luigi's expense (who expressed particular resentment at that remark). Due to the world structure of New Super Mario Bros. 2 (six main worlds and three optional special worlds), Worlds Mushroom and Flower (and their Koopalings, Larry and Lemmy) can be considered either to be preceded by World 6 (Bowser) or succeeded by Worlds 3 (Wendy) and 5 (Ludwig), respectively. Even though Sparkling Waters and Frosted Glacier are officially considered to be the third and fourth worlds of New Super Mario Bros. U, respectively, the player can choose to beat whichever one (and their Koopalings, Larry and Wendy) first. Similarly, while all the levels are numbered in Yoshi's Safari, the player can play them in any order they wish. Mario & Luigi: Paper Jam has the player fighting two or three of the Koopalings at once (Roy and Wendy, then Larry and Ludwig, then Morton and Lemmy (via Papercraft), who are joined by Iggy via traditional boss battle). In Paper Mario: Color Splash, the order each Koopaling is fought is listed in the order Mario collects the six Big Paint Stars, with Roy Koopa fought in Black Bowser's Castle. In the SNES version of Mario is Missing!, only Ludwig, Iggy, and Roy are fought, with Larry, Morton, Wendy and Lemmy only being depicted in the manual. In the DOS version, however, all except for Morton and Lemmy appear (although the latter two were planned to appear, at least in the CD-ROM Deluxe edition, due to the presence of unused voice clips). In Minion Quest: The Search for Bowser, Lemmy and Ludwig are both fought in the same level, albeit in different waves (Lemmy comes two waves before Ludwig). Although Monopoly Gamer is technically not a video game, the Koopalings nonetheless act as "bosses" for each deck. The order they are fought in is the same as in Super Mario Bros. 3. In Bowser Jr.'s Journey, Iggy and Wendy are fought in the same level, but Wendy is the fought one wave before Iggy, before fighting together in the last wave. Ludwig and Lemmy are never fought. Although the games themselves initially did not have the Koopalings speak (the DOS version of Mario is Missing! nonwithstanding), the Koopalings did have a variety of voice actors in various Mario media. In Amada Anime Series: Super Mario Bros., the Koopalings were voiced by Masaharu Sato (Larry and Iggy), Miyako Endo (Morton and Wendy), and Naoki Tatsuta (Roy, Lemmy, and Ludwig). In the DIC cartoons, the Koopalings were voiced by James Ransken (Cheatsy), Dan Hennessey (Big Mouth), Tabitha St. Germain (Kootie Pie), Tara Charendoff (Hop and Hip), Gordon Masten (Bully), and Michael Stark (Kooky). The Koopalings appeared in the interactive anime video Super Mario World: Mario to Yoshi no Bōken Land, and there they were given spoken dialogue. Their voice actors were not credited. In Mario is Missing!, the Koopalings, as noted above, were given dialogue. In the CD-ROM Deluxe version Larry, Iggy and Ludwig were voiced by Rob Wallace, Wendy was voiced by Kathy Fitzgerald and Roy was voiced by Bruce Sandig, who also voiced the unused clips of Lemmy Koopa. In Super Mario Advance 2: Super Mario World, the Koopalings did have voices, although they just gave dying screeches when defeated by Mario or Luigi. Additionally, they were all similar monster roars and only Iggy, Lemmy, Wendy and Larry used them. Starting with 2009's New Super Mario Bros. Wii, the Koopalings were given in-game voice acting, although it was largely composed of grunts and roars instead of actual dialogue. Larry, Morton, Wendy and Lemmy are voiced by Lani Minella, Iggy and Ludwig are voiced by Mike Vaughn, and Roy is voiced by Dan Falcone. 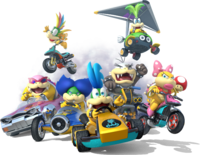 In Mario Kart 8, all the Koopalings, except for Roy, are voiced by new voice actors, with Morton, Ludwig, Iggy, Wendy, Larry and Lemmy being voiced by David Cooke, David J. Goldfarb, Ryan Higgins, Ashley Flannegan, Michelle Hippe and Carlee McManus respectively. This time, they do say actual words and phrases, besides their "No!" yells when defeated in the former games. In Super Smash Bros. for Nintendo 3DS / Wii U, as well as Super Smash Bros. Ultimate, the Koopalings have reused their voice samples from New Super Mario Bros. Wii. In Mario & Luigi: Paper Jam, the Koopalings have spoken dialogue for the first time since the Mario's Early Years! series. Their voice clips, however, are reused from Mario Kart 8. In Paper Mario: Color Splash, the Koopalings again have spoken dialogue. Although the Koopalings never actually spoke in the initial release of Mario & Luigi: Superstar Saga beyond uttering roars, they were given dialogue in Mario & Luigi: Superstar Saga + Bowser's Minions in the alternate story mode Minion Quest: The Search for Bowser, and to a lesser extent in the main game itself (although only Iggy, Ludwig, and Roy are actually seen speaking during this time). The voice clips are again the ones recorded for Mario Kart 8, and they are used in the Bowser Jr.'s Journey mode of Mario & Luigi: Bowser's Inside Story + Bowser Jr.'s Journey, in which the Koopalings have spoken dialogue. The Koopalings have a distinct theme music composed of several fast-paced beats. This was originally the boss music for Super Mario Bros. 3. However, starting with New Super Mario Bros. Wii, it became more clearly associated with them. In the latter, a rearragement of the original version was played when fighting them at the tower levels. 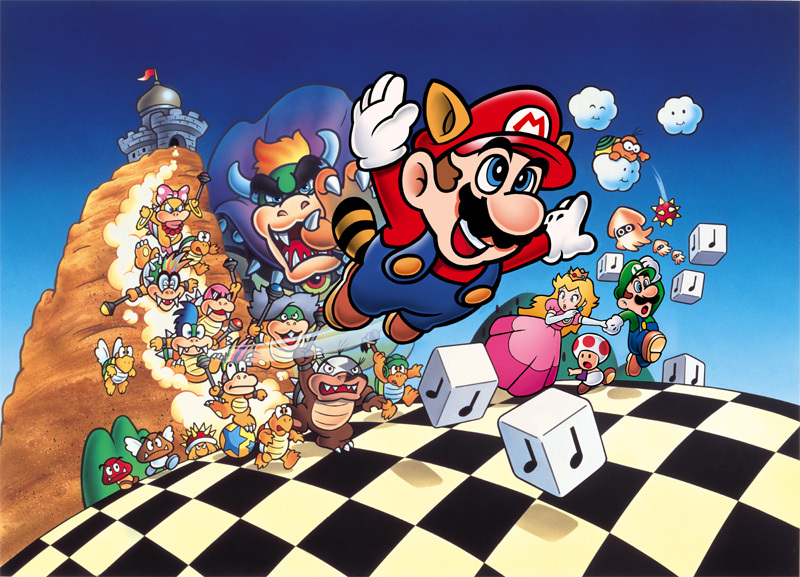 In the castle levels, and their fights from New Super Mario Bros. 2 onward, a different, slower-paced arrangement was played. In Paper Mario: Color Splash, each Koopaling got a unique battle theme for the first time. Larry's theme is composed of jazzy tunes with piano, cello, trumpets and electronic touches. Roy has a fast-paced theme with brass, drums, electric guitar, and modern additions, with the specific pitch, tone, and beat varying depending on which paint he has afflicted Mario with. Wendy's theme has mostly horns, bagpipes, acoustic guitar and deep vocals. Iggy has trumpets, horns, bass drums, and electronic mixes. Lemmy's theme consists of accordion, violin, xylophone, trombone and fast-pacing to replicate his circus boss fight and personality. Morton has electronic themes, violin, and sound effects. Ludwig has electronic themes with piano at the beginning, then electric guitar, trumpets, whistles, drums, xylophone, marimba and rasta-esque percussion to reflect the military and aquatic secret base themes of the battle. Aside from their individual boss themes, they also share an individual intro theme that consists of guitar strings (with the exception of Ludwig and Roy), which had been taken from the Tension theme used for the Royal Sticker bosses' introduction in Paper Mario: Sticker Star. For this subject's image gallery, see Gallery:Koopalings. Kuppa 7 Ninshū (Mario Kart 8, Smash Bros., Super Mario Memorial Book and Encyclopedia Super Mario Bros.) In general: 「クッパ」 Kuppa (Koopa) is Bowser's Japanese name. It is ambiguous whether 「コ」 ko represents 「子」 ko-, meaning "child", or 「小」 ko, meaning "little" or "young". 「コクッパ」 can thus mean "Child Koopa", "Little Koopa" "Young Koopa" etc. 「子クッパ」 is a rare variant of 「コクッパ」, seen on the back of the Japanese Super Mario Bros. 3 box and on the Nintendo Official Guidebook of Super Mario All-Stars. "7" or 「七」, when used with 「人」 nin to count people, is read as shichi; otherwise it is commonly read as nana. クッパの手下: Bowser's Minions. Also generally used of the members of Koopa Troop. Romanian Koopișori (The Adventures of Super Mario Bros. 3) Diminutive for "Koopa"
All the Koopalings have used Warp Pipes in at least one of their battles, aside from Larry Koopa. In Super Mario World, Lemmy and Wendy use pipes, in New Super Mario Bros. Wii, Roy uses them in his battle. In New Super Mario Bros. 2, both Morton and Ludwig use warp pipes and lastly in New Super Mario Bros. U, Iggy uses them. In Mario & Luigi: Paper Jam, every Koopaling is associated with Battle Cards. Roy and Wendy are the first bosses where Battle Cards can be used, Larry and Ludwig are the only bosses that can use their own Battle Cards, and Iggy, Morton, and Lemmy turn the player's Battle Cards into a special kind of Morton Battle Card, which either deals 60 damage to everyone, makes the player lose all of their star points, or gives the player a random Max Item. Lemmy is the only Koopaling who has used an exclusively defensive battle strategy in any of the games they're fought in, excluding Wendy's battle in Super Mario World, which reuses Lemmy's battle style. ↑ As explained on the Koopalings' profile on the New Super Mario Bros. U official site, as well as Larry's Super Smash Bros. for Wii U trophy. 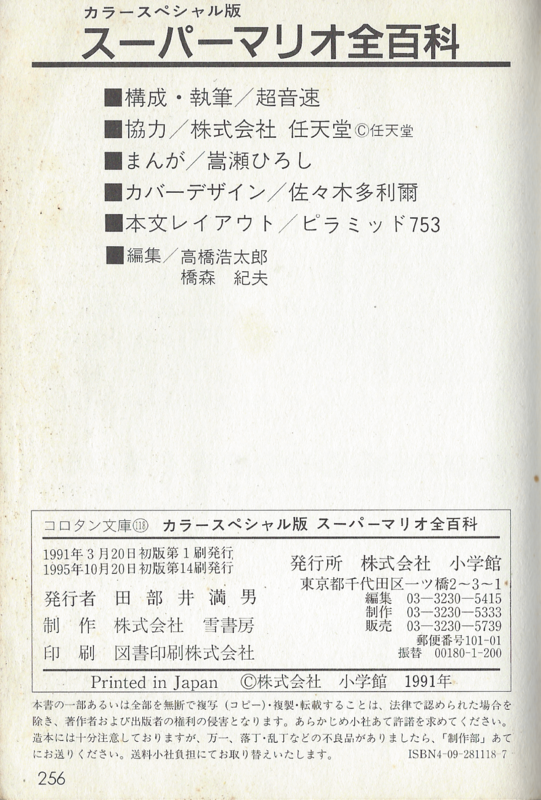 ↑ 2.0 2.1 On page 33Media:ESMB page 33.png of the Encyclopedia Super Mario Bros., there is this statement: 「※取扱説明書のものをそのまま掲載しています。」; despite this, the part of the story where the Koopalings are introduced is this one: 「さんざんこらしめたはずの大魔王クッパもマリオのいるキノコ王国からは手を引いたものの今度は子供コクッパ7兄弟を仲間に入れ、ワールドのあちこちでイタズラのやり放題。」; the 「自分の」 between 「今度は」 and 「子供コクッパ7兄弟」, which roughly means "[Bowser's] own" and is present on page 4 of the original Japanese Super Mario Bros. 3 manualMedia:SMB3_Japanese_manual_pages_4_5.jpg, is absent in this story. The meaning of the sentence is roughly unaltered, as this wording omitting the possessive pronoun has also been used in the Nintendo Official Guidebook of Super Mario World: Super Mario Advance 2 and Super Mario Advance 4: Super Mario Bros. 3, the latter of which also used the stronger form of the original story of Super Mario Bros. 3 showing the similar meaning of the two wordings, but the new one is less strong and explicit. ↑ 3.0 3.1 Super Mario Bros. 3 English instruction booklet. In the story section (pg. 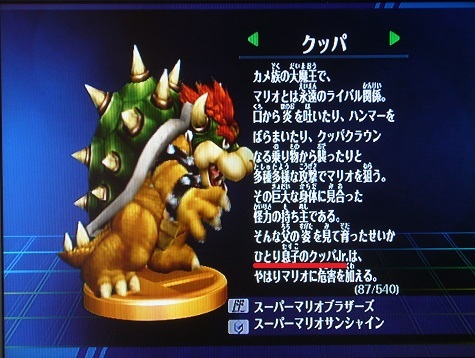 5), they are called "Bowser's 7 kids" and "his 7 children", and Bowser's line (pg. 3) reads "Ha Ha Ha! These are my 7 children that are going to help me take over the Mushroom World!" The children are introduced with the phrase "These are Bowser's kids!!" (pg. 4). Larry (pg. 5), Morton (pg. 9) and Lemmy (pg. 34) refer to Bowser as their father or dad. 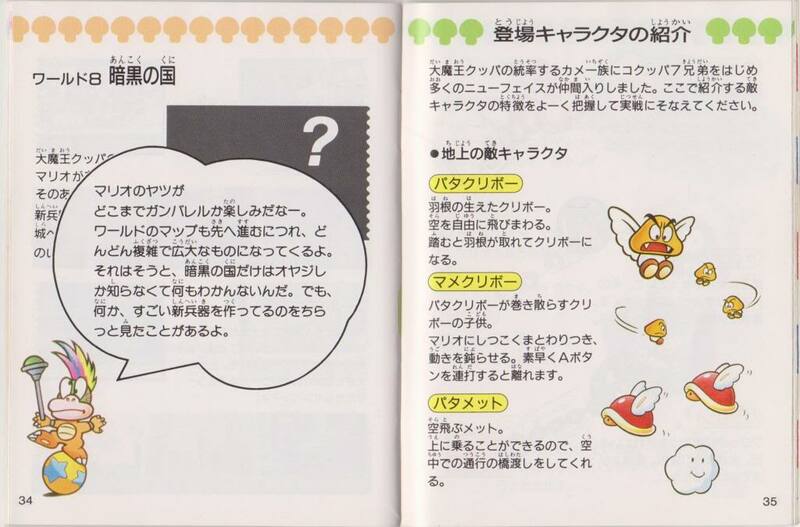 ↑ 4.0 4.1 In the Japanese instruction booklet of Super Mario Bros. 3, they are called 「自分の子供コクッパ7兄弟」 in the story section (pg. 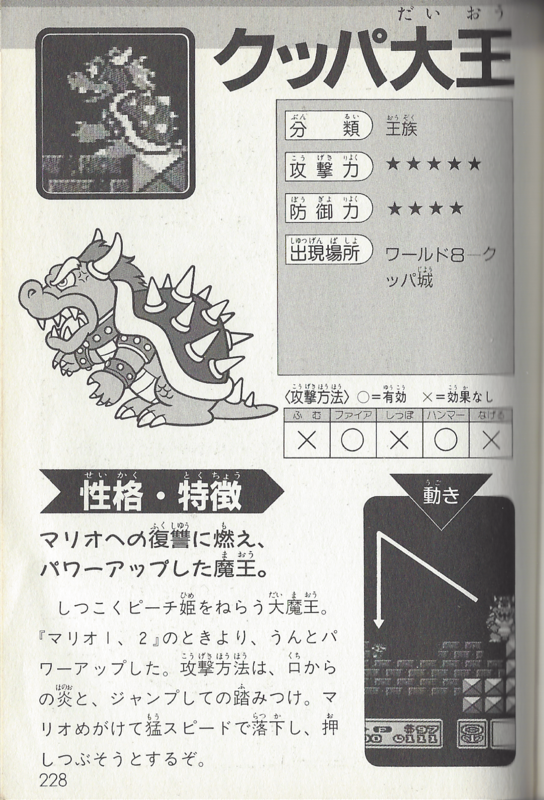 4Media:SMB3 Japanese manual pages 4 5.jpg), and King Koopa's line (pg. 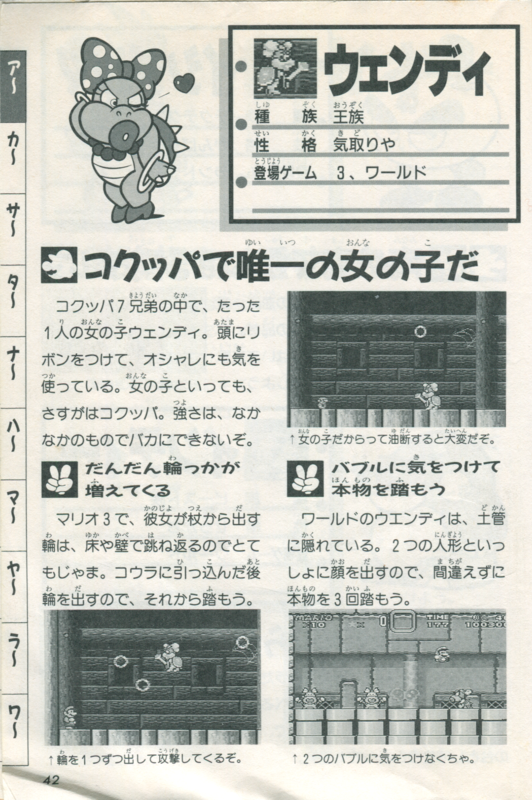 2Media:SMB3 Japanese manual pages 2 3.jpg) reads 「ワッハハ。これから俺様の息子達がこのゲームの説明をするぜ。息子達の言うことをよーく聞いてせいぜいガンバルことだな。ワッハハ。」 Note Koopa's use of 「俺様の息子たち」 (ore-sama no musuko-tachi), which equates to "my children" (or, literally, "my sons") while at the same time referring to himself in an arrogant manner. The children are introduced with the phrase 「そして、これがコクッパ7兄弟だ！！」 (pg. 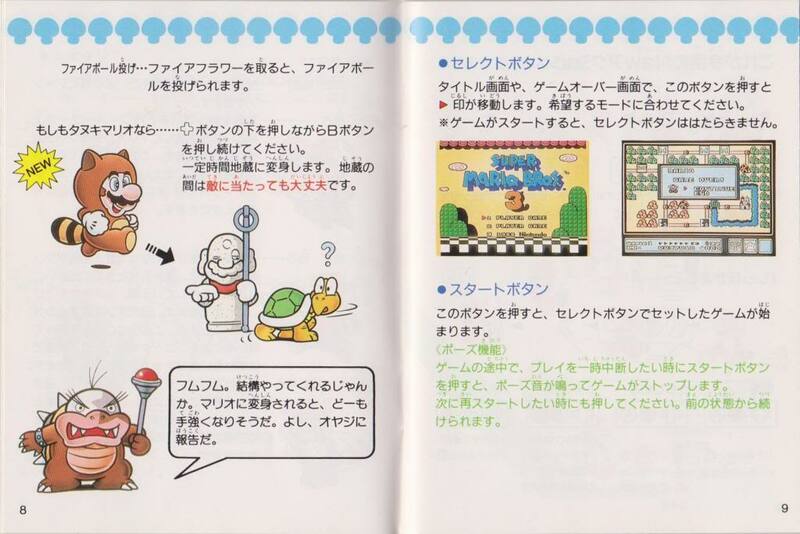 3Media:SMB3 Japanese manual pages 2 3.jpg). Larry (pg. 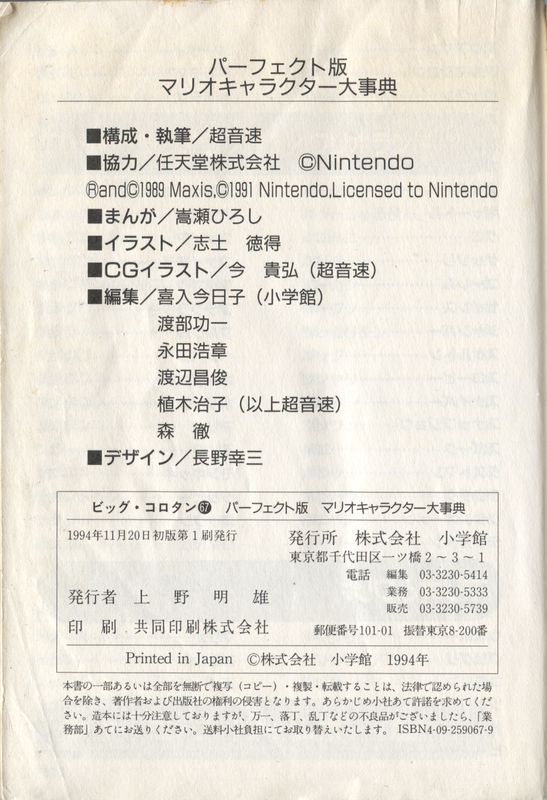 4Media:SMB3 Japanese manual pages 4 5.jpg), Morton (pg. 8Media:SMB3 Japanese manual pages 8 9.jpg) and Lemmy (pg. 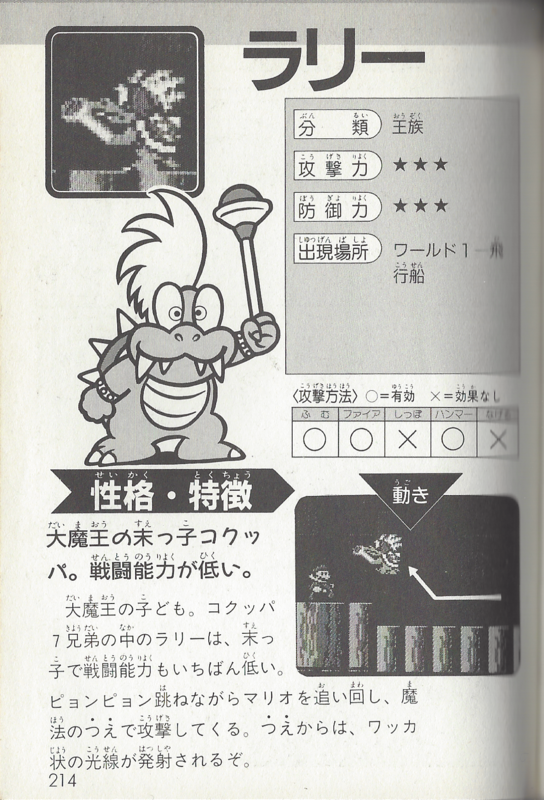 34Media:SMB3 Japanese manual pages 34 35.jpg) refer to King Koopa as 「オヤジ」 (oyaji), which is both a Japanese word for "father" as well as a term of endearment. ↑ 5.0 5.1 Japanese card about the Koopalings in Super Mario WorldMedia:Kokuppa SMB4 Card.jpg, in which they are referred to as 「クッパ大魔王の7人の息子たち。」, meaning "The seven children of the (demon/sorcerer) king Bowser.". Note that their name is written with 「7兄弟」 instead of 「7人衆」. ↑ 6.0 6.1 In Super Smash Bros. Melee, the first trophy of Bowser in Japanese refers to him as having 「7人のこども」Media:JSSBM Bowser Trophy.jpg. ↑ 10.0 10.1 Super Mario Bros. 3 on the official Nintendo of Benelux site. Retrieved December 10, 2016. 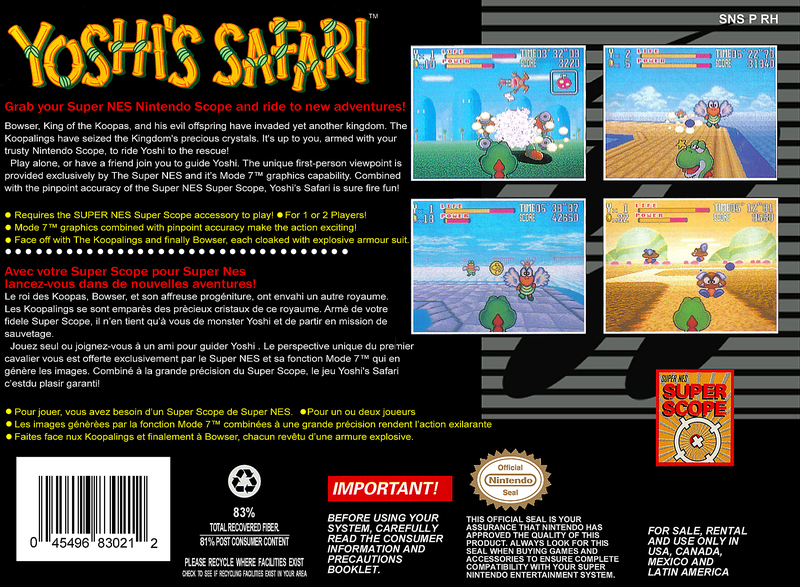 ↑ 11.0 11.1 Back of the North American box of Yoshi's SafariMedia:SnesyoshissafariBack.jpg. ↑ 13.0 13.1 13.2 "Bowser's oldest Koopaling and second in command, he's a real monster!" - Nintendo Power Strategy Guide for Super Mario Bros. 3, page 9. ↑ BeardBear (December 3, 2015). Mario & Luigi Paper Jam Walkthrough Part 27 | Neo Bowser Castle #5 & Bosses Koopalings. YouTube. Retrieved December 4, 2015. 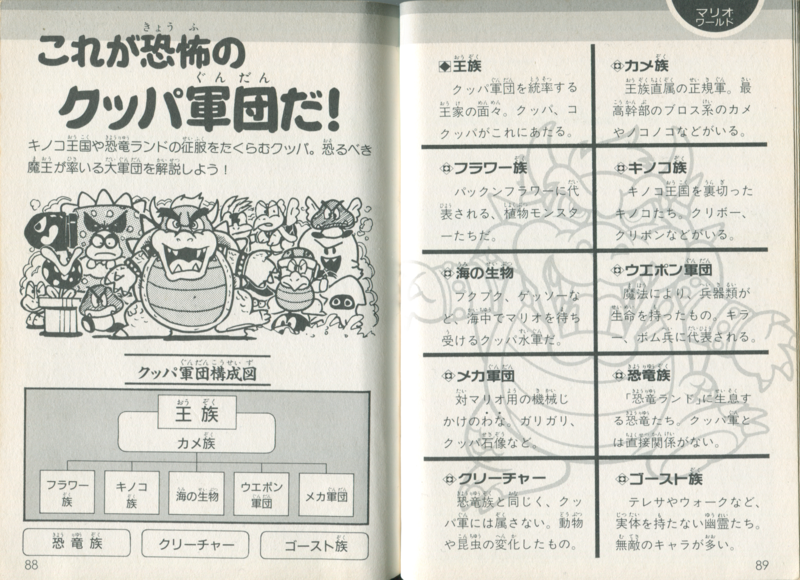 ↑ Page 65 of the Japanese Official Nintendo Guidebook of Super Mario All-StarsMedia:Bowser Koopalings sketch.png. The caption states At first Bowser's appearance was not entirely settled. In order to get to this version of the sketch, Kotabe and Tezuka collaborated multiple times. Note how the page is dedicated the Famicom Disk System version of Super Mario Bros.: The Lost Levels, known as Super Mario Bros. 2 in Japan. ↑ Interview with Shigeru Miyamoto in Mario Mania Player's Guide, p. 31. ↑ As explained by Dayvv Brooks (former Nintendo of America employee), on July 18, 2012. ↑ Super Mario Bros. 3 Japanese instruction booklet, page 3. ↑ Specifically, Roy Koopa appeared on Swinging Bars of Doom, Morton, similar to the Japanese version of the card, appeared on Airship's Revenge, Ludwig appeared on The ol' Switcheroo, and Iggy appeared on Piped Full of Plants. ↑ New Super Mario Bros. 2 Prima guide, page 75. ↑ nightram56 (January 12, 2011). Koopalings plushes. YouTube. Retrieved December 12, 2016. ↑ Nintendo 公式チャンネル (November 17, 2015). マリオ＆ルイージRPG ペーパーマリオMIX 紹介映像. YouTube. Retrieved October 26, 2016. ↑ bukininn (November 23, 2015). . Twitter. Retrieved November 24, 2015. ↑ Zephiel810. (May 1, 2015). Puzzle & Dragons: Super Mario Bros. Edition - Final Boss + Ending. YouTube. Retrieved: May 11, 2015. ↑ BeardBear (October 2, 2016). Paper Mario Color Splash - All Roshambo Bosses (Rock Paper Wizard Battles). YouTube. Retrieved October 3, 2016. ↑ BeardBear (October 2, 2016). Paper Mario Color Splash - All Boss Cards (Koopalings, Kamek & Bowser's Castle). YouTube. Retrieved October 3, 2016. ↑ Boss Fight Database (September 28, 2016). Paper Mario Color Splash: Larry Boss Fight (1080p 60fps). YouTube. Retrieved September 29, 2016. ↑ Mario kicking Wendy, Bowser and LudwigMedia:SMSQPB6 Mario Kick opt.png, note how Bowser's tail is drawn while Ludwig's tail is not. 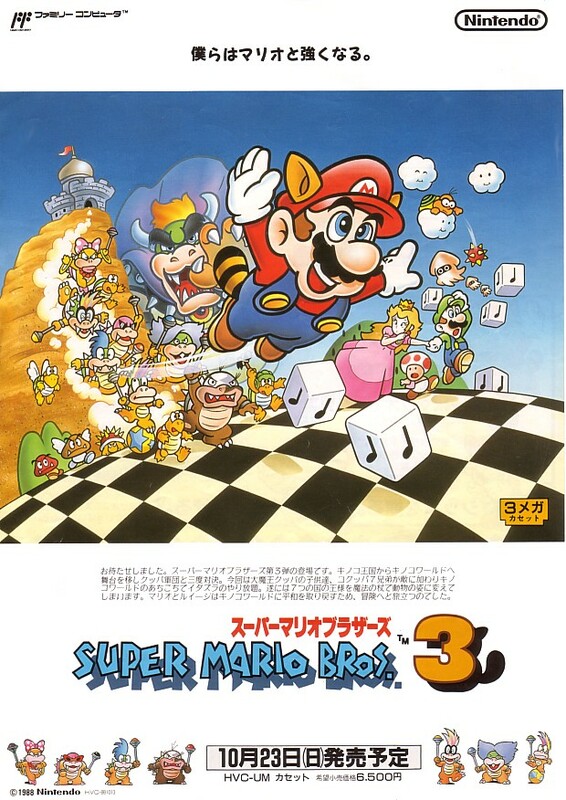 ↑ Main cast artwork for Super Mario Bros. 3 in which Iggy's tail can be seen. ↑ https://play.nintendo.com/activities/quizzes/which-mario-kart-8-racer-are-you-most/ If you get Bowser. 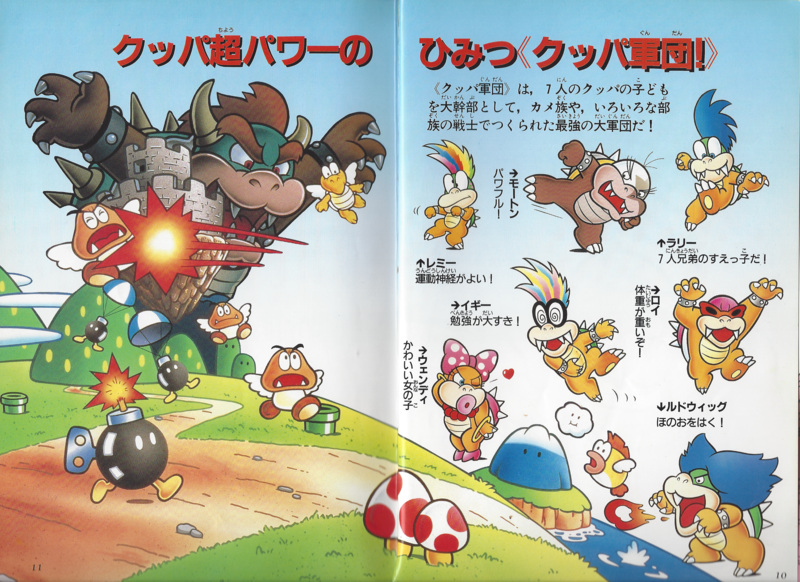 ↑ A Japanese promotional pamphlet for Super Mario Bros. 3Media:SMB3 - Japanese Promotional Pamphlet.jpg The Koopalings are called 「大魔王クッパの子供達」 (Daimaō Kuppa no kodomo-tachi), which means "Great Demon King Koopa's children". 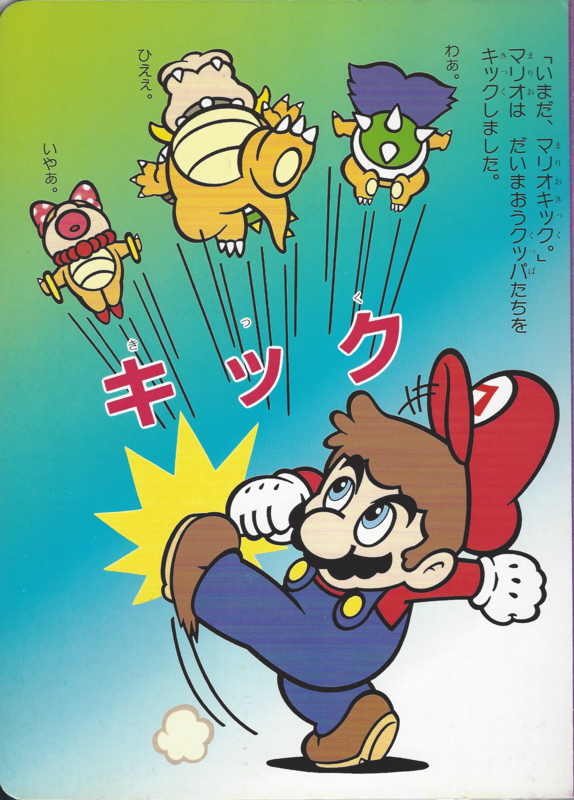 The picture of this pamphlet is found in every version of Super Mario History 1985-2010 booklet except North American. ↑ Nintendo Co., Ltd. (2003). 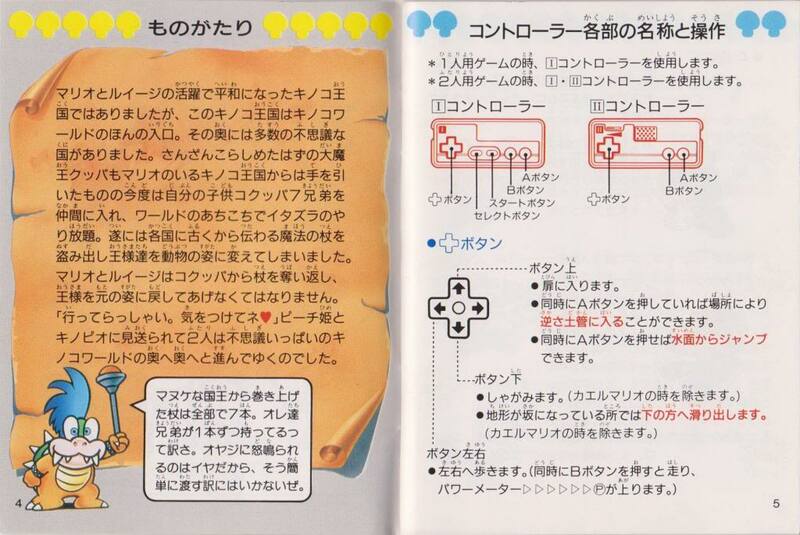 Scans of the Japanese manual of Super Mario Advance 4. Retrieved December 23, 2015. 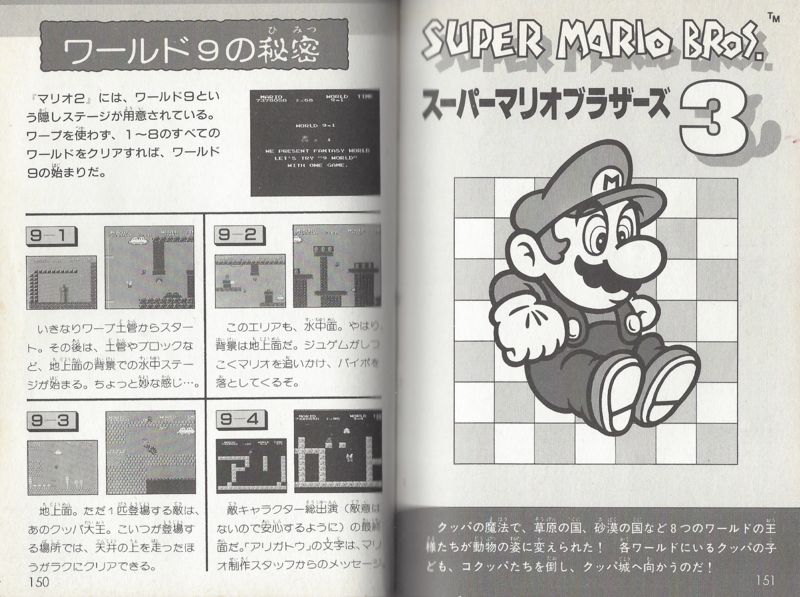 ↑ Scans of the original Japanese Super Mario Bros. 3 manual, hosted on Nintendo Co. Ltd. site. Retrieved November 10, 2016. ↑ Super Mario Bros. 3 Wii Virtual Console website, released December 11, 2007. 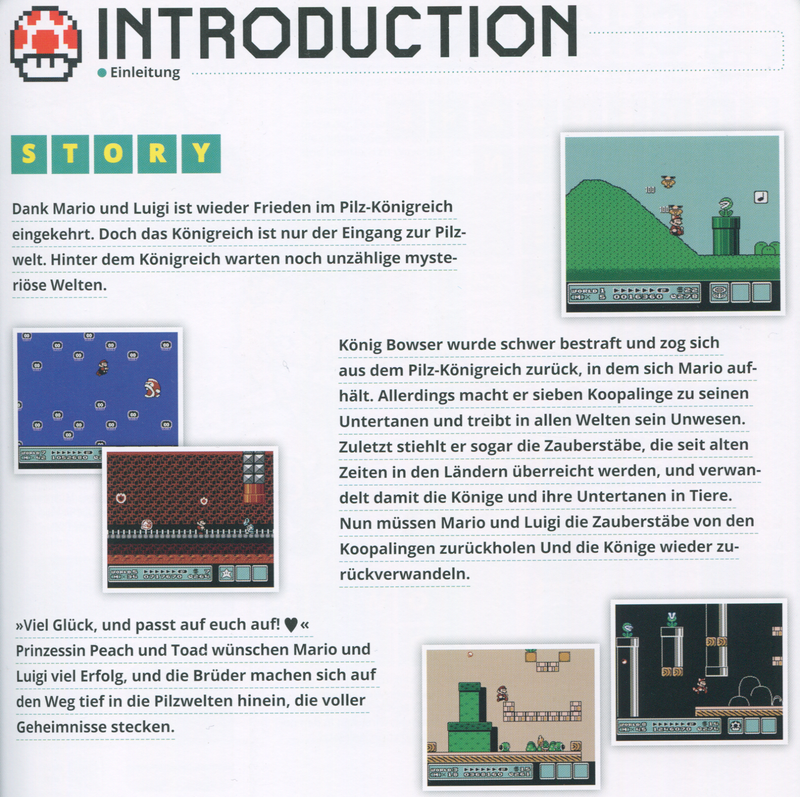 ↑ An excerpt of page 33 of the German translation of the Encyclopedia Super Mario Bros.Media:ESMB German SMB3 Story.png, containing the story of Super Mario Bros. 3. The sentence Allerdings macht er sieben Koopalinge zu seinen Untertanen roughly means Indeed he turned seven Koopalings into his subjects. 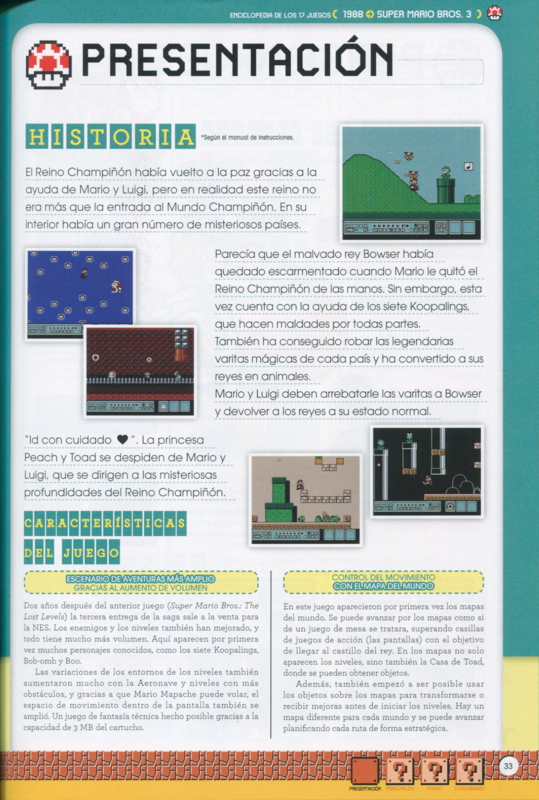 ↑ Page 33 of the Spanish translation of the Encyclopedia Super Mario Bros.Media:ESMB Spanish page 33.png, containing the story of Super Mario Bros. 3. The sentence Sin embargo, esta vez cuenta con la ayuda de los siete Koopalings, que hacen maldades por todas partes. roughly means Nonetheless, this time [he] has the help of the seven Koopalings, who cause troubles everywhere. ↑ At page 33 of the French translation of Super Mario Bros. Encyclopedia, in the story of Super Mario Bros. 3 it is told Bowser a envoyé ses sept enfants agir comme bon leur semble au sein du Monde des Champignons habituellement plutôt calme. (Bowser sent his seven children to act as they see fit within the usually rather calm Mushroom World). At page 144 in the general enemy description of New Super Mario Bros. Wii it is told Les sept frères et soeurs de la famille Bowser sont également présents[...] (The seven siblings of the Bowser family are also present). ↑ Nintendo of Europe. Scans of the European manual of Super Mario Advance 4. Nintendo of Europe CDN. Retrieved March 8, 2016. ↑ 49.0 49.1 Page 4 of the Japanese Nintendo Official Guidebook of Super Mario Advance 4: Super Mario Bros. 3Media:SMA4 Japanese Guide Page 4.png. Note how, while in the story they are referred as [Bowser's] own children (「自分の子どもの「コクッパ7兄弟」」), in Bowser's bio the possessive referred to the children term (「子どもたち」) is missing like in the case of the Nintendo Official Guidebook of Super Mario World: Super Mario Advance 2. 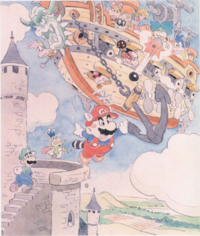 ↑ Super Mario World English instruction booklet, page 20Media:SMW NA Manual Pages 19 20.png (Mysterious Sunken Ship description). 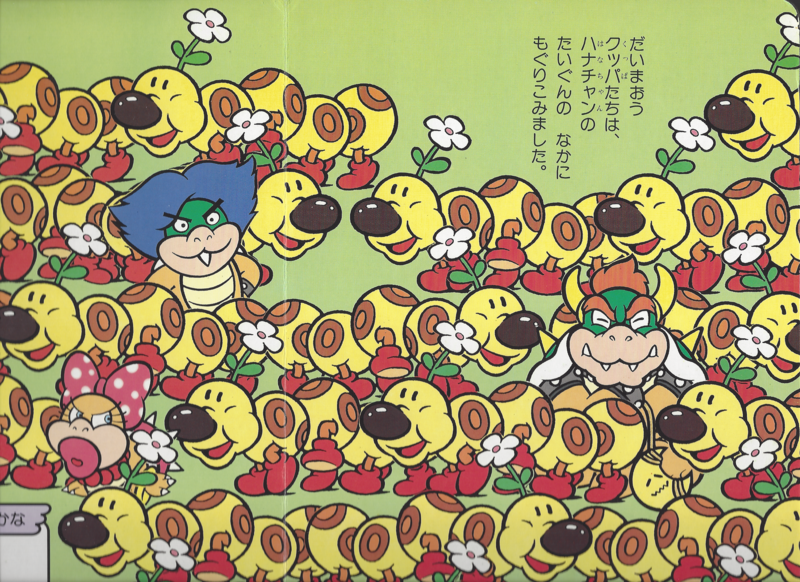 ↑ Page 32 of the first volume of the Japanese Nintendo Official Guidebook of Super Mario World, part of the second unit of the volume, named CharacterMedia:SMB4 Koopa Family.png. The reddish purple headers used for both Bowser and the Koopalings indicate that they are part of the Koopa family, as the explanatory header on the upper left corner shows. 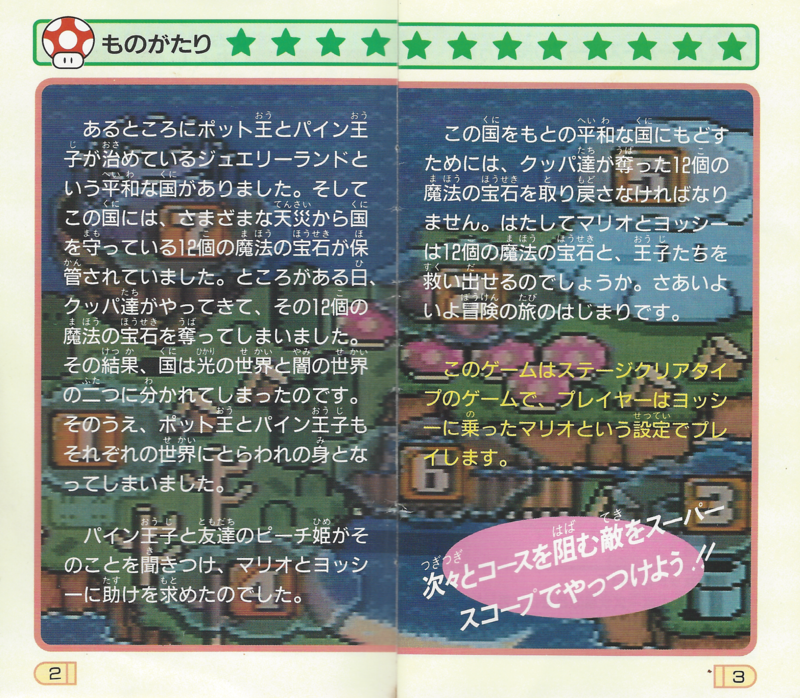 ↑ 52.0 52.1 Page 20 of the Japanese Nintendo Official Guidebook of Super Mario World: Super Mario Advance 2Media:SMA2 Japanese Guide Page 20.png. The Koopalings are stated being 「7匹の子ども=コクッパ」, roughly meaning (Bowser's) seven children=Koopalings using an implicit possessive pronoun. ↑ In both the Super Mario World sectionMedia:SMCE pages 18 19.png, the the Super Mario Bros. 3 sectionMedia:SMCE page 214.png and the section about the Koopa TroopMedia:SMCE pages 88 89.png of the Super Mario Complete Encyclopedia (「スーパーマリオ全百科」), a book written in 1991 in collaboration with NintendoMedia:SMCE page 256.png, the Koopalings are considered, along with Bowser, to be part of the King Tribe (「王 族」), that page 89Media:SMCE pages 88 89.png states being formed by every member of the royal family that leads the Bowser Army corps (「クッパ軍団を統率する王家の面々」). 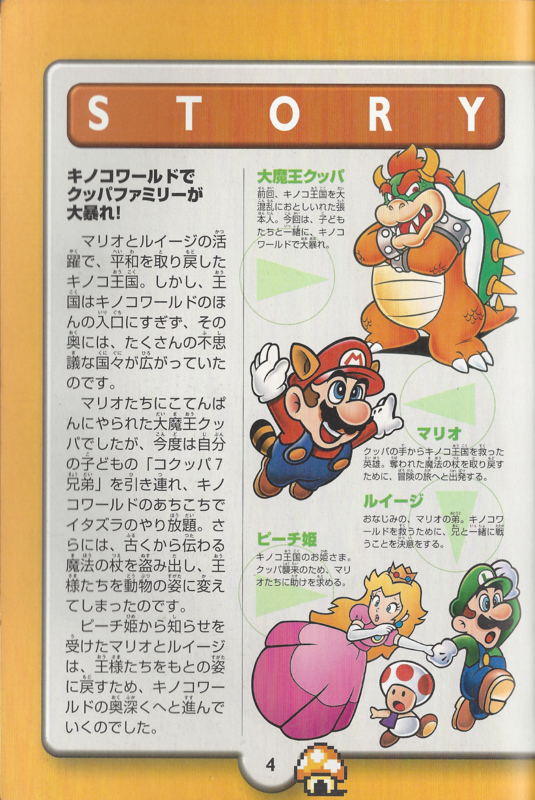 In particular, their relationship is explained in the Super Mario Bros. 3 section of the book, where the Koopalings are stated, on page 151Media:SMCE pages 150 151.png, to be Bowser's children 「クッパの子ども、コクッパたち」) and where Bowser on page 228Media:SMCE page 228.png is referred to as the demon/sorcerer king (「大魔王」) and on page 214Media:SMCE page 214.png Larry Koopa is stated to be the youngest child of the demon/sorcerer king (「大魔王の末っ子」), while the Koopalings are stated to be siblings as well (「コクッパ7兄弟」). 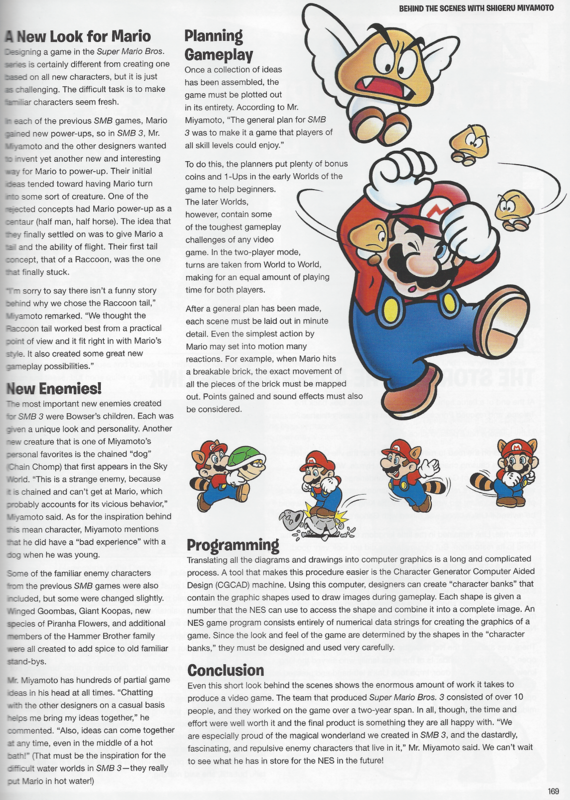 ↑ On page 193 of the Perfect Edition of the Great Mario Character Encyclopedia (「パーフェクト版マリオキャラクター大事典」)Media:PEGMCE page 193.png, a book written in 1994 in collaboration with NintendoMedia:PEGMCE Last Page.png, Roy is shown as an example of Bowser's Group (「クッパ系」), further described as the family of the Great King Bowser (「クッパ大王の一族」), on page 228Media:PEGMCE pages 228 229.png Larry is stated to be the son of the Great Demon/Sorcerer King Bowser (「クッパ大魔王の子供」); finally on page 42Media:PEGMCE page 42.png the Koopalings are called again the 7 Koopalings Siblings (「コクッパ7兄弟」). 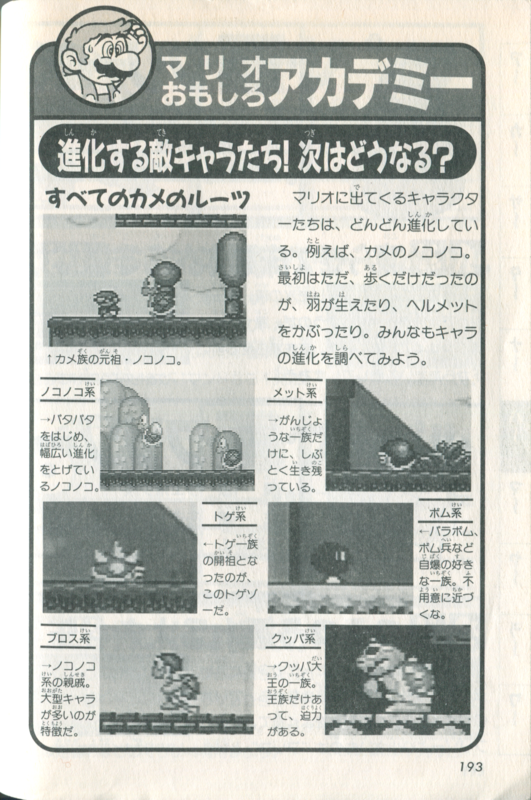 ↑ On pages 10 and 11 of the Super Mario Bros. Daizukan (「スーパーマリオ大図鑑」)Media:SMBD pages 10 11.png a book written at the end of 1994 under the supervision of NintendoMedia:SMBD Colophon.png, the Koopa Troop is stated to have Bowser's seven children as its great leaders (「7人のクッパの子どもを大幹部として」), with the Koopalings presented below. Furthermore, on pages 34 and 35Media:SMBD pages 34 35.png, it is explicitly stated that Koopalings=Bowser's children (「コクッパ=クッパの子ども」), with Morton and Ludwig presented as one of the seven children of the Great King Bowser (「クッパ大王の7人の子どものひとり」), Larry being presented as the youngest of the seven children of the Great King Bowser (「クッパ大王の7人の子どものすえっ子」)　and Roy's bio starting with Among the sons of Bowser, he's the heaviest (「クッパのむすこの中で,　もっとも体重が重い」). 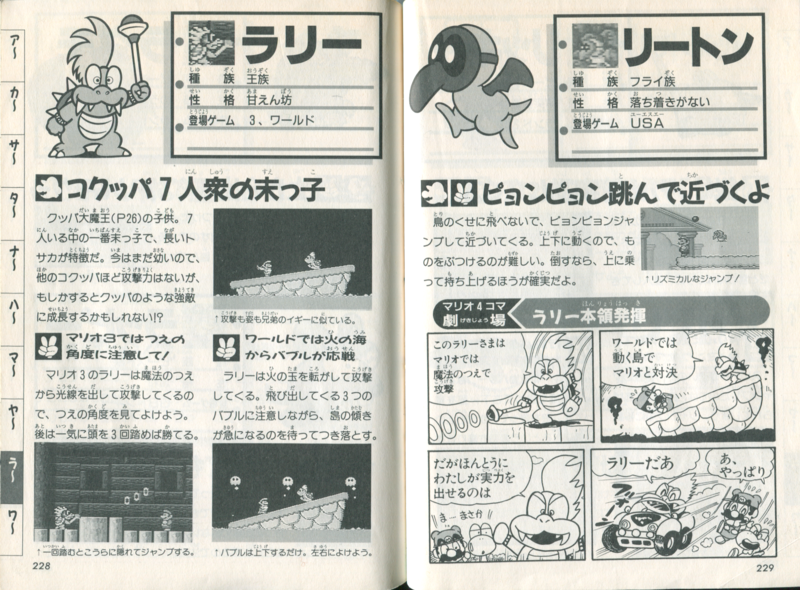 ↑ Pages 2 and 3 of the Japanese manual of Yoshi's SafariMedia:YRH Manual pages 2 3 opt.png, which contain the story of the game. Bowser and the Koopalings are together called 「クッパ達」 Koopa-tachi, just like in other Japanese material such as Super Mario Story Quiz Picture Book 6: Friend Kidnapped (「スーパーマリオおはなしクイズえほん 6 さらわれたともだち」)Media:SMSQPB6 Kuppa tachi.png. ↑ Mario is Missing! SNES instruction booklet, page 2. ↑ The first trophy of Bowser in the Japanese version of Super Smash Bros. BrawlMedia:JSSBB Bowser Trophy.jpg. ↑ European New Super Mario Bros. Wii website showing the initial name change to "Bowser's Minions" in Europe (albeit while grouped together with Bowser Jr. as the "Koopa Clan"). ↑ "Just when Mario and the gang were ready to give the Princess her gifts, Bowser's bratty kids crashed the party!" - New Super Mario Bros. Wii Prima Official Game Guide, page 18. ↑ "After you reach Bowser Jr.'s chamber, the bothersome Koopaling hops into his flying carriage." - New Super Mario Bros. Wii Prima Official Game Guide, page 129. ↑ ゲーム情報チャンネル (May 5, 2014). マリオカート8 Direct 2014 4 30 プレゼンテーション映像. YouTube. Retrieved January 28, 2018. ↑ An official poll in which the fifth choice for Bowser's New Year's resolution is "Try to spend more time with the Koopalings." Retrieved May 22, 2015. ↑ As an example, Larry's TALK_CUPCHAT_PR_LOSE_LAR_USUAL_0 line in the Wii U version of Mario & Sonic at the Rio 2016 Olympic Games states 「さすがに予選で負けるってのは はずかしいな。仲間たちには笑われるだろうしクッパさまにはドヤされるだろうし、まいったぜ。」 Note the use of both 「仲間」 and 「クッパさま」. ↑ aika (December 11, 2015). 【3DS】マリオ＆ルイージRPG ペーパーマリオMIX　ルドウィッグ＆ラリー戦. YouTube. Retrieved November 10, 2016. In the dialogue at the beginning of the battle against Larry and Ludwig, Larry doesn't call Ludwig brother, while in the English versions and in most other Western translations he does. ↑ Games' Art (December 30, 2015). 38 Mario e Luigi: Paper Jam Bros ITA - Neo Castello di Bowser parte 2. YouTube. Retrieved January 14, 2016. After Iggy presses the button, Lemmy says: "Daaaaaad! This is not fair!". ↑ LETSPLAYmarkus (January 19, 2016). MARIO & LUIGI: PAPER JAM BROS. # 57 ★ Der letzte und höchste Rang! [HD | 60fps]. YouTube. Retrieved January 19, 2016. After being defeated, Morton says: "Forgive us... Father. I mean of course... Master Bowser!". ↑ While in the preview the Koopalings are referred to using the Bowser's minions term (scagnozzi di Bowser) used in the New Super Mario Bros. games, and even though in the final game Morton mentions the boss (il capo) without specifying who he's supposed to be, as soon as Bowser is revealed Ludwig, Wendy, Larry and Roy always refer to him by name without adding any other title, Roy even directly asks Bowser to avenge his defeat, this attempt being absent in the Japanese version. Furthermore, the Koopalings are always referred to as Little Bowsers (Bowserotti, the Italian term originally used for the Koopalings, itself a direct translation of the ｢コクッパ｣ term), as can be seen already before fighting Larry, even when the Japanese version explicitly use the Bowser's minions (｢クッパの手下｣) term in place of the Team of 7 Bowsers (｢クッパ7人衆｣) term that should be translated as Bowserotti, as can be seen before fighting Lemmy (where in the Japanese version ｢クッパの手下｣ is used and in the Italian localization Bowserotti is used instead), as well as in the GB_RedRescue13 line of the 13th Rescue Red Toad who states Hai già sconfitto Morton, Iggy, Ludwig, Wendy e Larry. Ti restano solo due Bowserotti! (while the Japanese version again uses the ｢クッパの手下｣ term). ↑ On Page 22 of the Italian manual of Monopoly Gamer Collector's EditionMedia:MGCE Italian Manual page 22.png, the Koopalings' bio states I Bowserotti sono sette dei più pericolosi, cattivi e perfidi scagnozzi di Bowser. which means The Koopalings are seven among the most dangerous, bad and malicious minions of Bowser. ↑ In the Japanese version of Minion Quest: The Search for Bowser Bowser Jr. is stated in his bio to be 「大魔王クッパの1人息子」 (Great Demon/Warlock King Bowser's only son), similarly in the Italian localization his bio states È l'unico figlio di Bowser (He's the only son of Bowser) and in the German localization his bio states Bowsers einiziger Sprössling (Bowser's only offspring). ↑ Story section of the official Japanese site of New Super Mario Bros. U Deluxe. ↑ "Bowser's youngest Koopaling, Larry, has taken over the Grass Land." - Nintendo Power Strategy Guide for Super Mario Bros. 3, page 9. ↑ "Being one of the older Koopalings, Morton's ship is more advanced than Larry's, and more dangerous!" - Nintendo Power Strategy Guide for Super Mario Bros. 3, page 24. ↑ "Roy, the guardian of The Sky, is a little heavier than his younger family, and he pounds the ground when he lands from a jump, paralyzing Mario for a moment. Keep off the ground when Roy lands, and employ the regulation ‘’three head stomps or 10 fireballs’’ takedown method. " - Prima Official Strategy Guide for Super Mario Advance 4: Super Mario Bros. 3, page 15. ↑ Behind the Voice Actors page of Mario is Missing!. ↑ Fieke Meowstic (September 27, 2016). Paper Mario: Color Splash - All Koopaling Battle Themes. YouTube. Retrieved September 29, 2016. ↑ Super Mario’s memorial book commemorates his 30th birthday. Newlaunches. Retrieved October 12, 2015. ↑ Super Mario All-Stars Limited Edition instruction manual (Korean version). pp. 17 and 29. ↑ Story section of the official New Super Mario Bros. 2 site in Chinese. Nintendo of Hong Kong. Retrieved February 27, 2016. Bowser / Baby Bowser / Dry Bowser • Bowser Jr. This page was last edited on April 11, 2019, at 19:44.